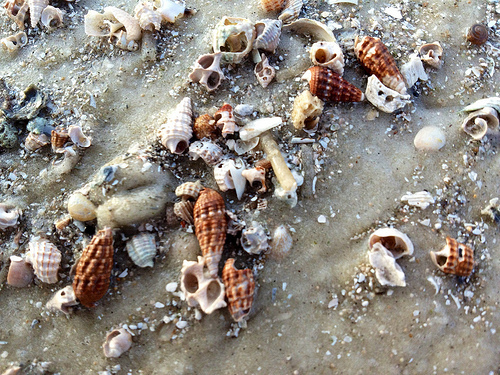 A random act of shelling at Bunche Beach, originally uploaded by Erin *~*~*. containers in the big kitchen cabinet. for some (hopefully delighted) tourist to find. 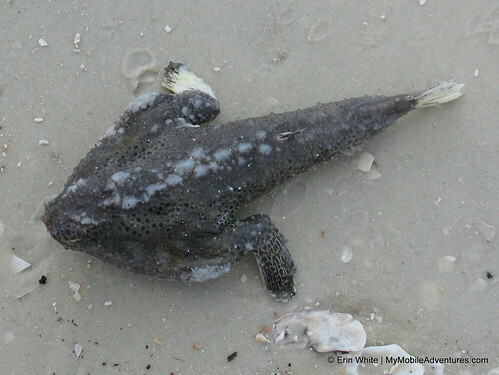 Striped burrfish at Bunche Beach, originally uploaded by Erin *~*~*. 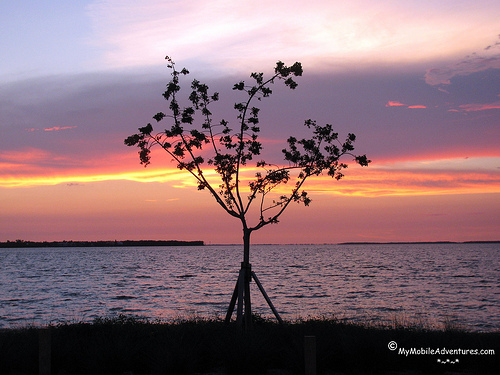 After photography class the other day, during which I was treated to a dizzying array of fun facts about my digital camera, I went for a walk at San Carlos Bay Bunche Beach Preserve in Fort Myers. The Gulf coast has suffered a recent spate of red tide occurrences, ranging from up in Sarasota to as far south as Naples, on the northern tip of the west Everglades. This, combined with a series of cold fronts, has resulted in some fish kill. While dead fishes washing up en masse isn’t fun for anyone, it does afford an opportunity to examine species that a non-fishing enthusiast (like me) would not normally get to see. 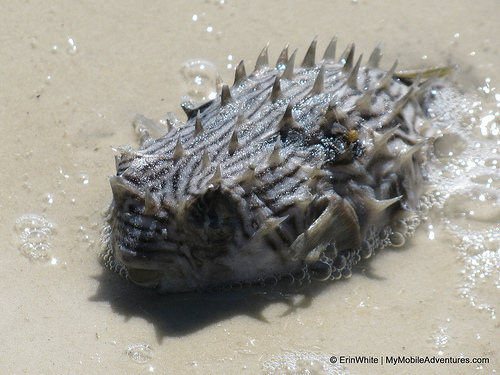 This is a *striped burrfish*, also called a *spiny boxfish*. The first thing I noticed about it, aside from the painful-looking spines, was his black spots. 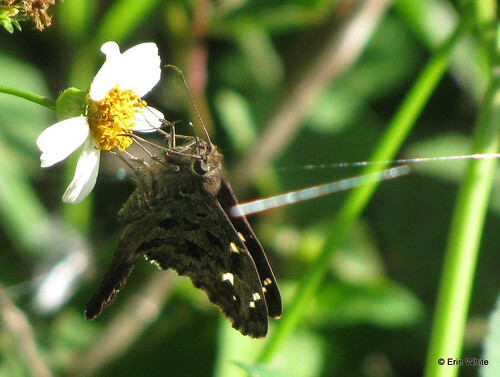 This reminded me of some butterfly species who have “false eyes”, dots on their wings that fool predators into thinking it’s a much larger “something else”, something not so tasty as a butterfly. According to some quick research, the striped burrfish seems to like warmer waters than we’ve had; although they range up to New Jersey for spawning, that usually happens only when the water up north is warmer, typically July. The southern end of their range is the West Indies. 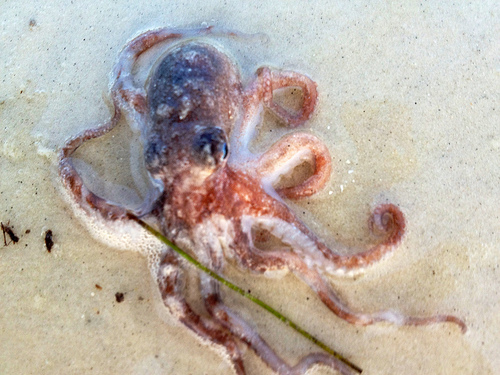 The beaches were cleaned of dead fish after last week’s episode with red tide, so I’m leaning toward the possibility that this little dude expired of the cold. SUBSCRIBERS: if you do not see a video below this sentence, please click through to the blog. Reflected glory, originally uploaded by Erin *~*~*. Our beautiful reward, originally uploaded by Erin *~*~*. Shorebird smorgasbord, originally uploaded by Erin *~*~*. 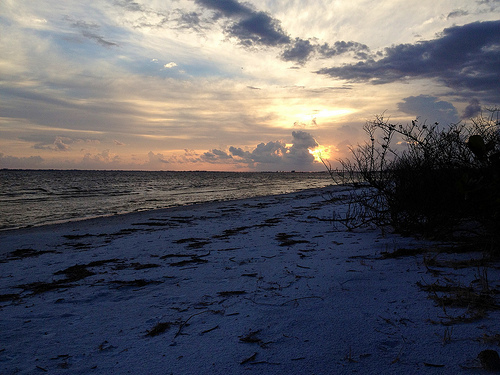 Bonus Adventure: Another Bunche Beach sunset, originally uploaded by Erin *~*~*. I feel a sunset coming on in a few hours. 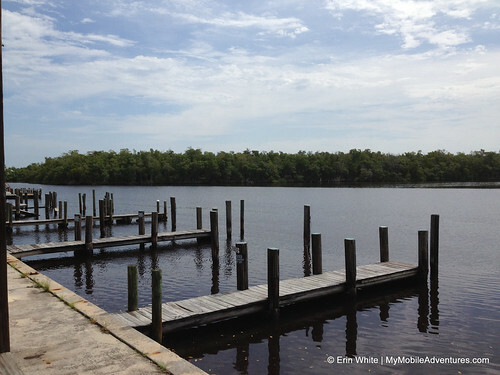 The wind is steady and persistent off the water – feels AWESOME after sweating on the inland trails all afternoon! Coming around Bowditch Point, originally uploaded by Erin *~*~*. Waxing blue moon, originally uploaded by Erin *~*~*. In just two more days, that will be the full blue moon. The next blue moon won’t be for several years yet. 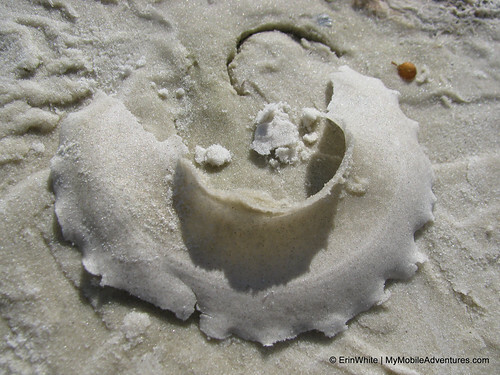 I loved my visit to Bunche Beach Preserve – l will be back! Causeway bridge from Bunche Beach, originally uploaded by Erin *~*~*. It’s a small world, originally uploaded by Erin *~*~*. 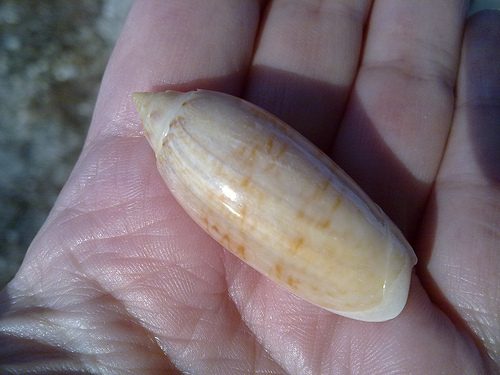 If you like miniature shells, this may be the place for you! The view from Bunche Beach, originally uploaded by Erin *~*~*. 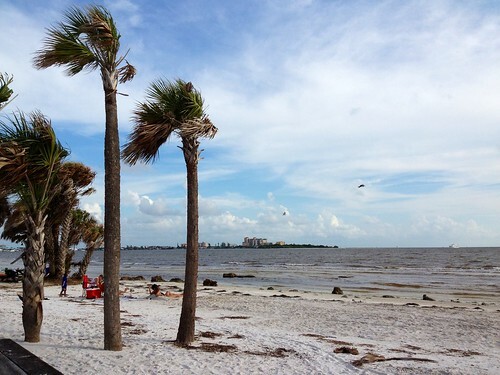 You can see Fort Myers Beach from here – looks like you could swim over, if you really wanted to. 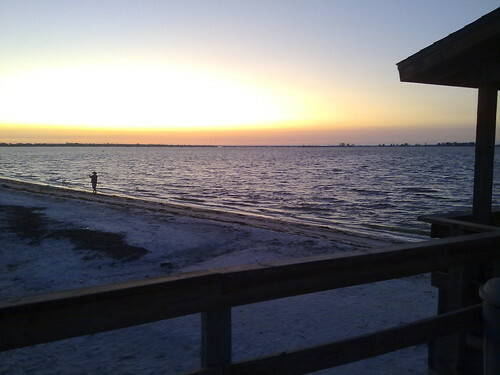 Bunche Beach at sunset, originally uploaded by Erin *~*~*. 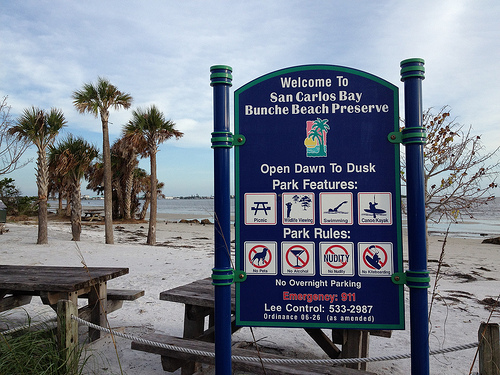 I was on my way home from Sanibel and decided to stop at Bunche Beach, which is a Lee County Conservation 20/20 preserve located at the end of John Morris, off Summerlin. What a pretty place! Doesn’t get any better than this, originally uploaded by Erin *~*~*. 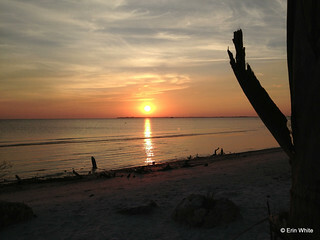 Goodnight, Sanibel, originally uploaded by Erin *~*~*. Alas, not seeing the moon – I guess there’s too much cloud cover. My legs hate me because I not only made them run a couple of miles today but I also made them squat down on the beach forty or fifty times to check out the miniatures that had washed up. Time for dinner. 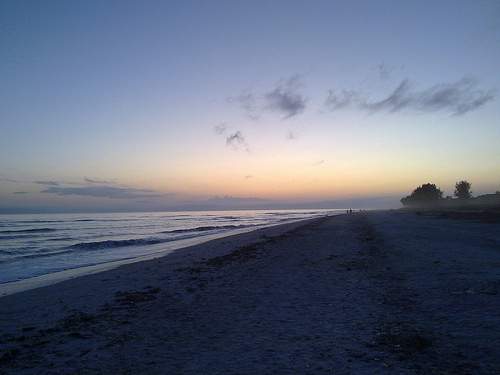 Goodnight, Sanibel! 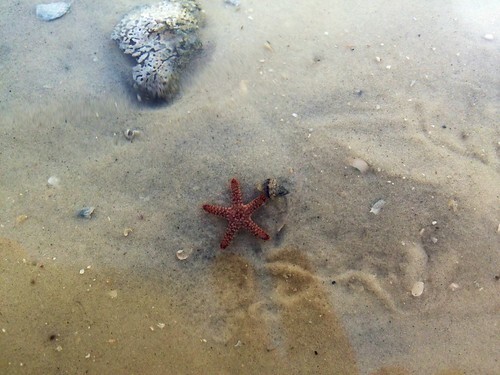 Adrift on a Sanibel beach, originally uploaded by Erin *~*~*. As I work my way around he point, the wind picks up, blowing my hair back instead of in my eyes 🙂 Now I can JUST see to take an artsy shot. 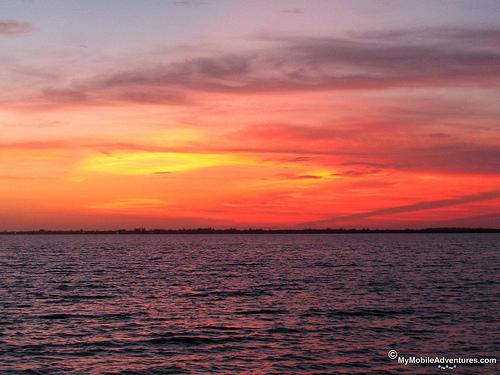 Fiery Sanibel sunset, originally uploaded by Erin *~*~*. 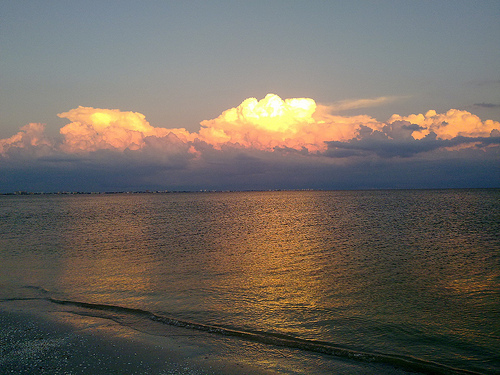 The clouds to the east reflect the Sanibel sunset sometimes more gloriously than the sunset itself. Might not get to see the moon tonight due to these buggers, but this is decent compensation in my book! 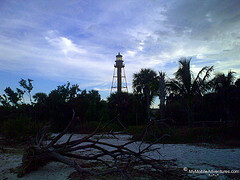 Reflectged glory on the Sanibel lighthouse beach, originally uploaded by Erin *~*~*. Sunset and moonrise will happen at about the same time tonight – I think I have about a half hour more of this bliss before it grows too dark to be here. Beach bean sprouting, originally uploaded by Erin *~*~*. Lighthouse beach transformed, originally uploaded by Erin *~*~*. What a different beach from last week! I’ve come to catch a glimpse of the full harvest moon when it rises. 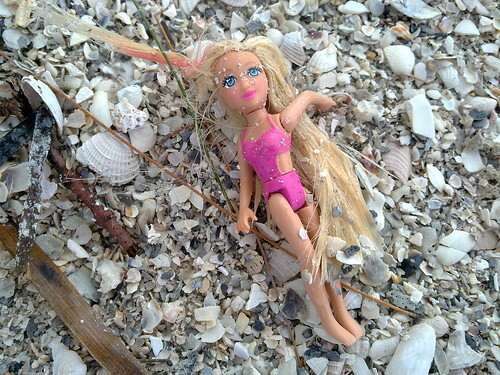 There must have been some storm that washed this beach clean immediately after the dunes. 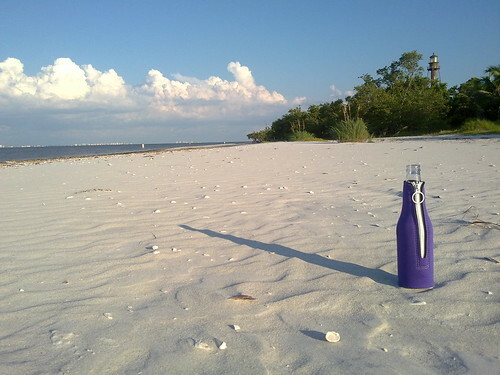 The blowing wind creates sandy waves and makes y beer bottle sing. I fully expect a tumbleweed to roll by. 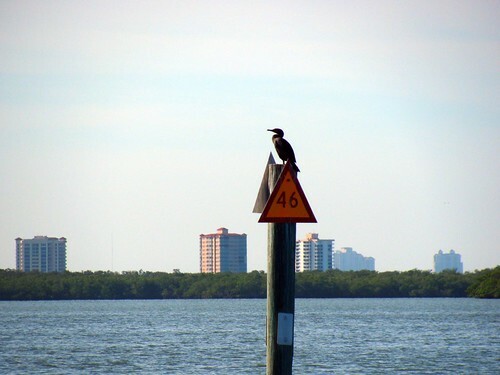 Standing sentinel on Sanibel, originally uploaded by Erin *~*~*. Tanins near the Edison Pier, originally uploaded by Erin *~*~*. 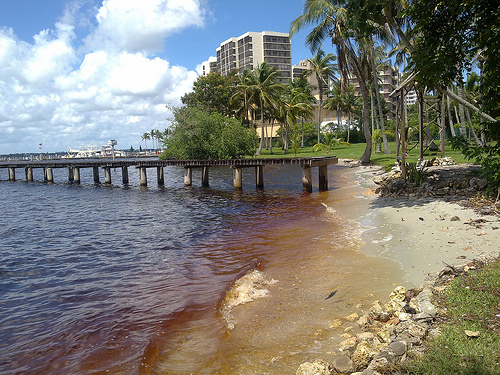 There must be mangroves nearby, for the river is tinted a rusty red near Edison’s Pier. This was the very first structure built on the estate. 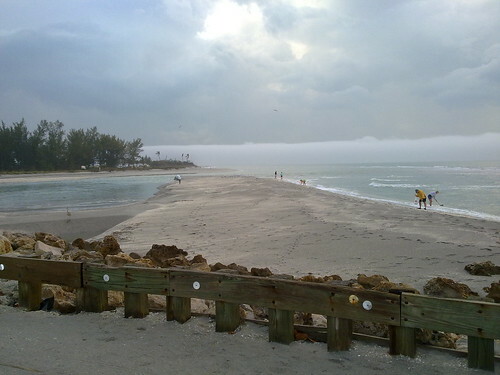 Sanibel Beach near the Pointe Santo resort, originally uploaded by Erin *~*~*. 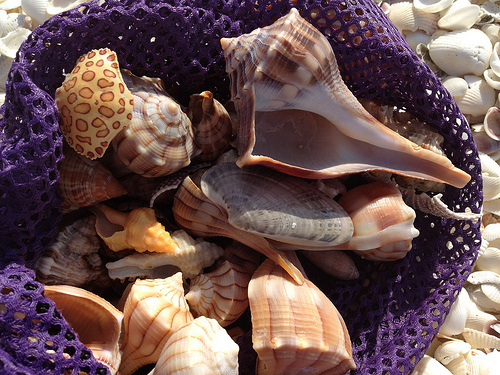 There are lots of waves hitting the Sanibel Island beaches, and a wonderful breeze but no shells! It doesn’t matter, though – I’m really happy to have spent an hour roaming the beach. Walking out to the beach, originally uploaded by Erin *~*~*. 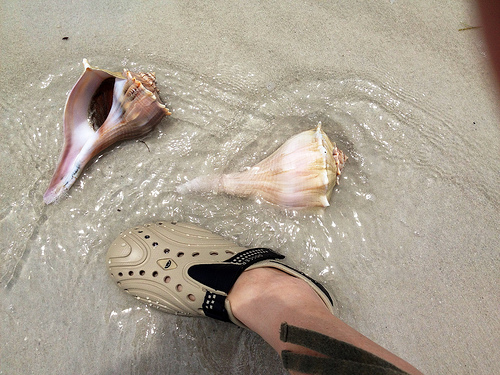 The Gulf has some waves – off to investigate! It was a beautiful afternoon on the docks, originally uploaded by Erin *~*~*. We had a lovely time. The sun was warm, the breeze was steady and the child only got into trouble 4,387 times 😉 The Isle of Long is indeed beautiful this time of year. 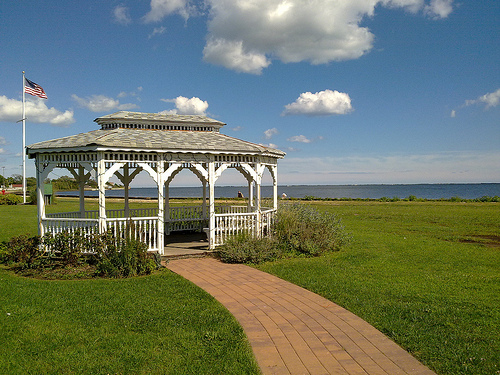 Gazebo on the bay, originally uploaded by Erin *~*~*. The Loverly Isle of Long sure is loverly 😉 This would be a nice place for special occasion photos. There’s also a narrow blacktop path that would be good as part of a running route through the neighborhood. Beach combing on Great South Bay, originally uploaded by Erin *~*~*. Squatter’s eye view from the footbridge, originally uploaded by Erin *~*~*. 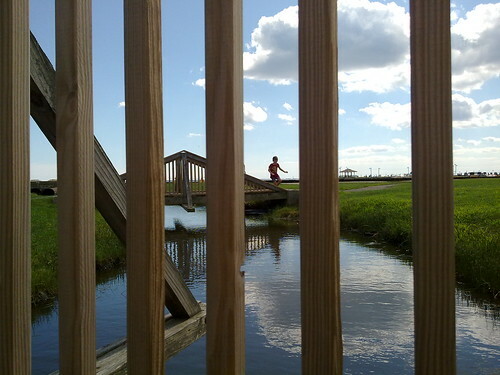 Crossing the marsh at Sunken Meadow, originally uploaded by Erin *~*~*. A good friend lives quite close to a foot path that leads into Sunken Meadow Park. there’s a bridge that crosses a sort of a bayou that dumps into a large marshy area to the west, which is the direction this photo faces, and the Nissequogue River to the east. Sunken Meadow Park, Lomg Island, originally uploaded by Erin *~*~*. 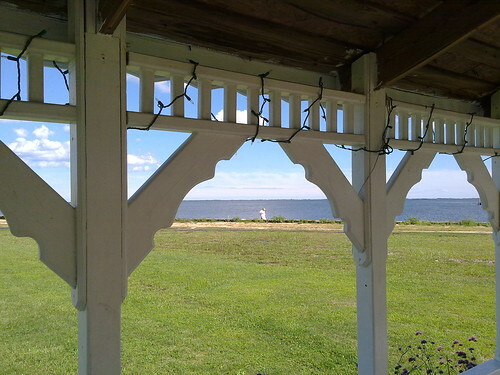 We’re standing at the west end of the boardwalk on the beach at Sunken Meadow Park on Long Island. The beach is flanked by bluffs to the east and west; this one, I believe, is Callahan’s. 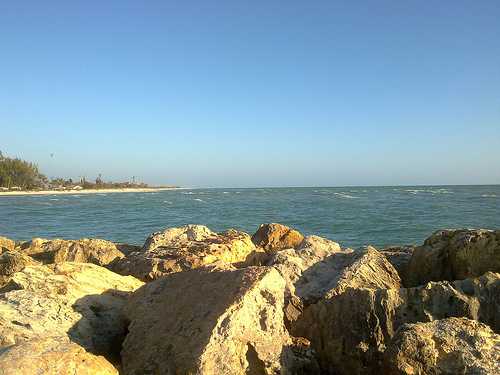 The bluff to the east (not pictured) is at the end of Old Dock Road. 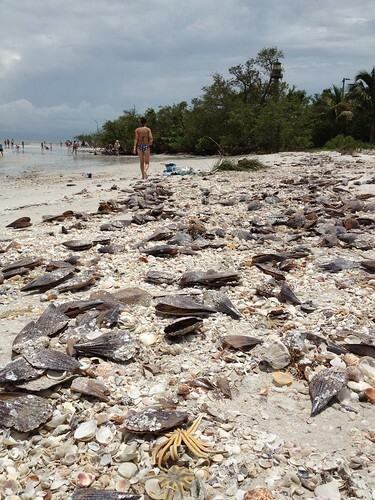 On Sanibel we go shelling. BUT –, originally uploaded by Erin *~*~*. 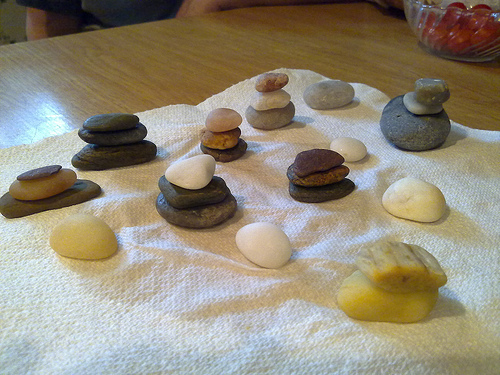 I wanted some stones I could stack on my desk in a Zen-like manner, so I went to Sunken Meadow State Park and found all these candidates. 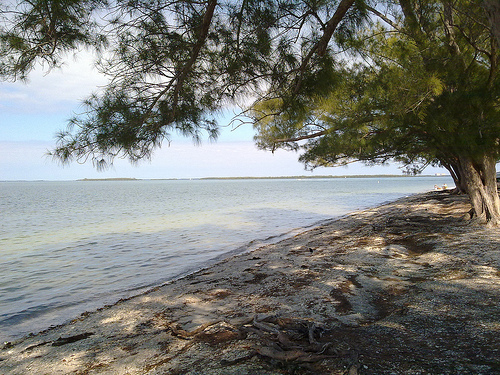 Directly after we finished up with the Field Trip On Estero Bay, we all got into our cars and drove down to Lover’s Key State Park for some more nature geek fun. 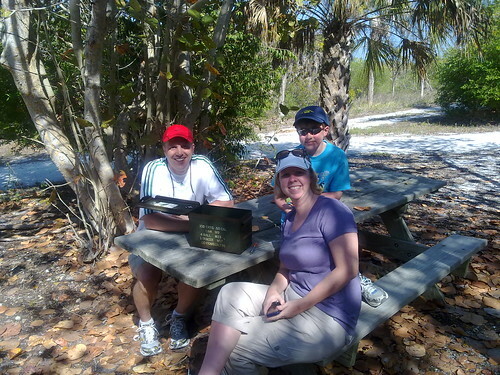 First we all congregated in a shady area, settled in at picnic benches and ate our bag lunches. 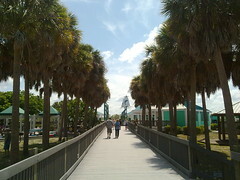 Then we proceeded down the path to the beach to go seining. “Seine” is not just a river in France. 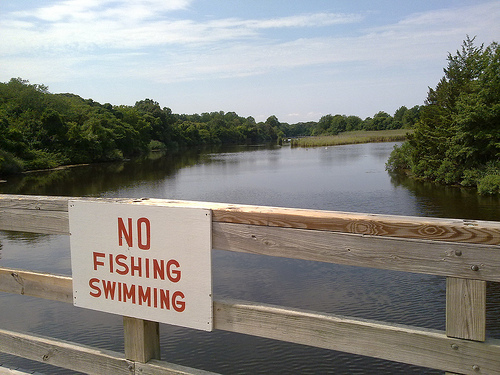 A seine is a net that is used to capture small fish and other aquatic life. The seines that we used on this field trip look like a volleyball net strung between two poles. There are floats at the top of the net and weights at the bottom. 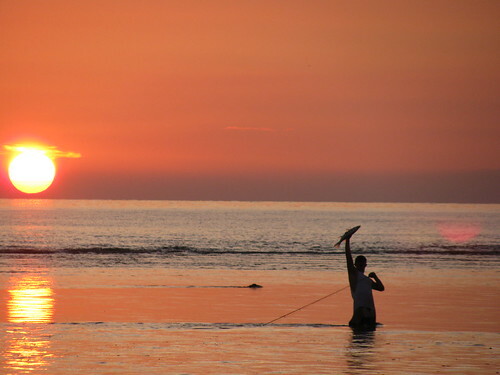 I take one pole, you take the other, we stretch the net between us and then we walk through the water, slowly trawling toward the beach. Then, quickly, before someone perishes, we scoop up what we found and place it in tanks for observation. When we’re done learning, we set the critters free. 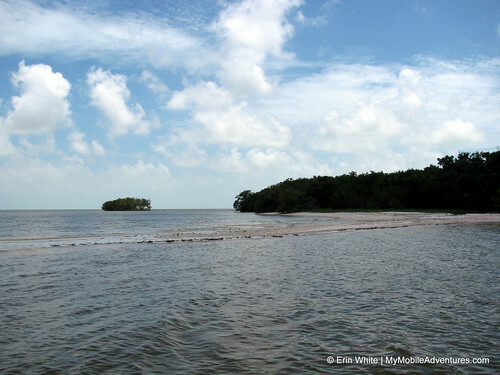 Lover’s Key is a Florida state park that is comprised of several islands/keys. 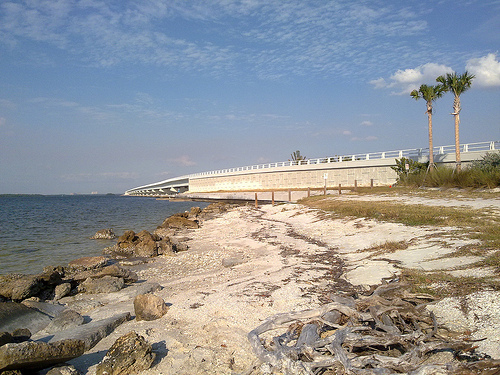 The Bonita Beach Causeway cuts through it coming down from Fort Myers Beach. 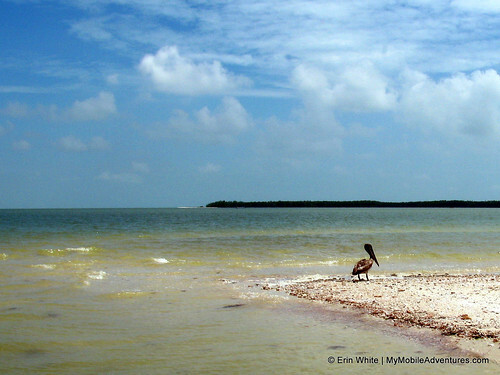 This proved to be an excellent site for studying the Southwest Florida coastal environment. 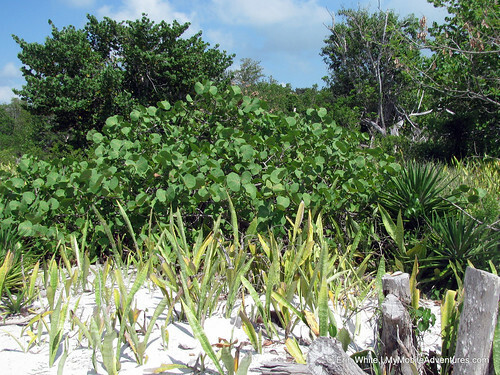 Lovers Key is covered with many different species of plant life. In true geek fashion, I am starting to find the biodiversity of nature to be endlessly fascinating, so I was happy to crawl all over the place with my camera after the expedition had ended. 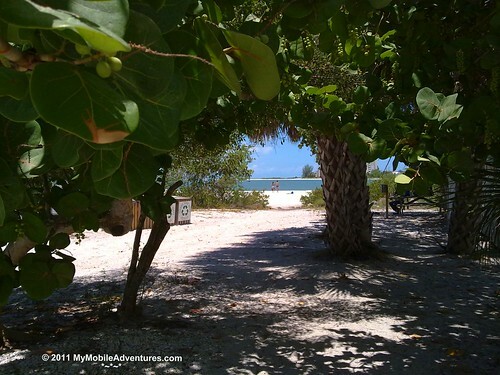 Here’s a shady nook close to the causeway entrance with a path down to the beach. Notice we are standing under the dense shade of a cluster of trees that include seagrapes; the branches overhead were heavy with fruit. A different path to the beach here leads over a wooden bridge that spans a small bayou of sorts. Look at those clouds pop, huh? 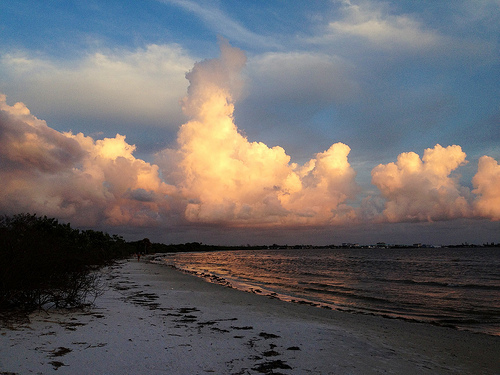 The beauty of the Southwest Florida sky is endless. 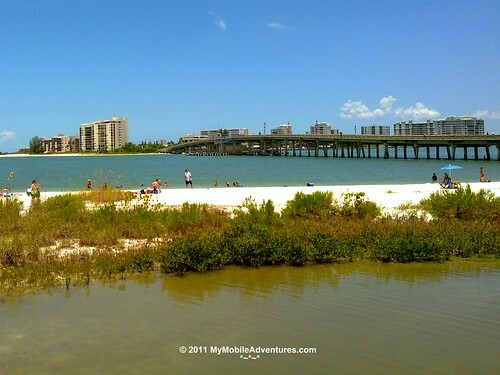 Here’s a view across the bayou toward the beach, Big Carlos Pass and the hi-rise condos beyond. 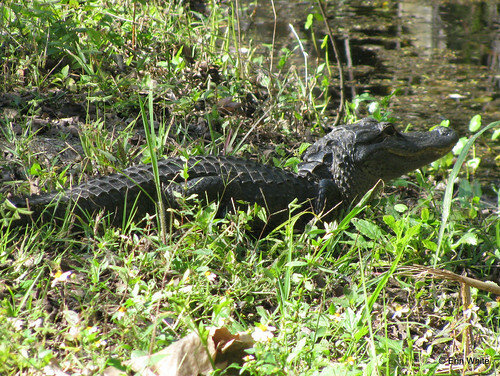 Note that there are plenty of hidey-places along the shore of the bayou; not sure what nests there but futher back in the protected area, I would not be surprised if there were some gators lurking now and then. 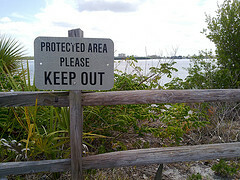 Funny thing about protected areas; in addition to the critters, they might be protecting YOU, too! 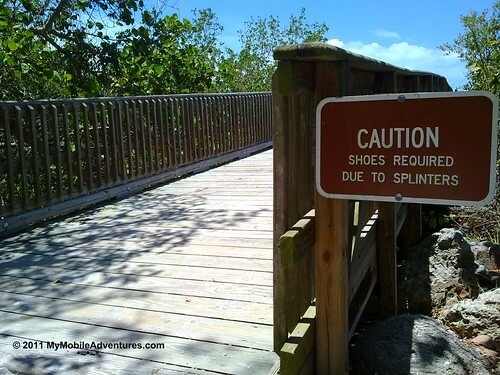 So always take heed of the signs, OK? I don’t want to hear that you became lunch! A LOVER’S KEY BLUE CRAB | Our instructors equipped us with plastic tanks which we filled with salt water from the beach in preparation for examining our finds. These tanks had “bubblers” attached to keep the water aerated and moving. 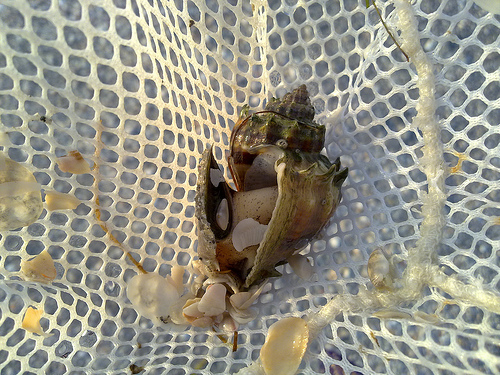 Our first seining attempt brought up a couple of crabs. Can’t really tell what the one submerged is – speckled, maybe? 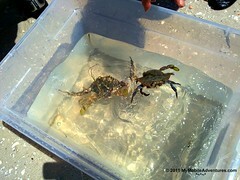 but on the right is a male blue crab. Normally, you turn them over to see if they are male or female. The female will have a marking underneath that is rounded like the US capital dome, whereas the male will have more of an obelisk-shaped marking, like the Washington Monument. In the case of blue crabs, however, the female’s claws are tipped in bright orange. I don’t see any orange on this one, so it’s a male. Floating behind him are his sectioned “swimmies” – swimming paddles that are attached to the rear leg. I don’t have any other worthy photos of the critters we saw, which included several types of fishes, some snails and a sea horse! It’s hard to photograph them in the tanks with the brilliant sunshine blasting them and the water distorting them. Also, I need to solve the problem of handling my camera while my hands are salty, sandy, wet, or any combination thereof. 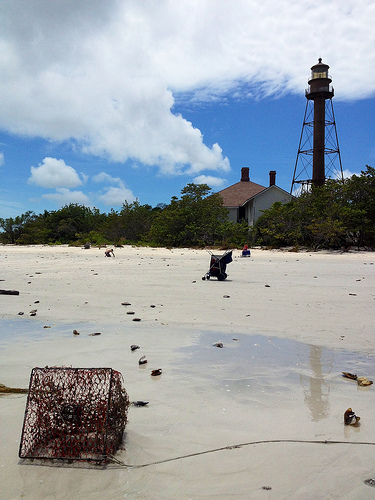 After the seining expedition was done, I stuck around to take a few photos and find some plants for identification. Sea oats are one of the types of grasses that grow in the dunes. They are perennial and multiply by means of underground rhizomes. They can grow to be six feet tall or more! 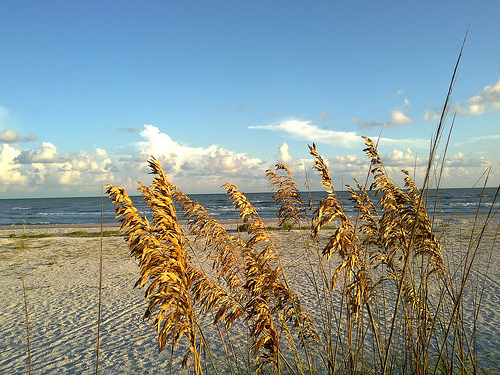 You’re not allowed to collect wild sea oats because they play a critical role in helping to keep the dunes together. 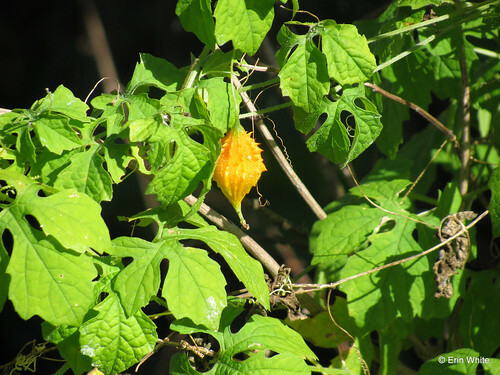 This is one of two tropical plants that look similar and are often confused with one another. 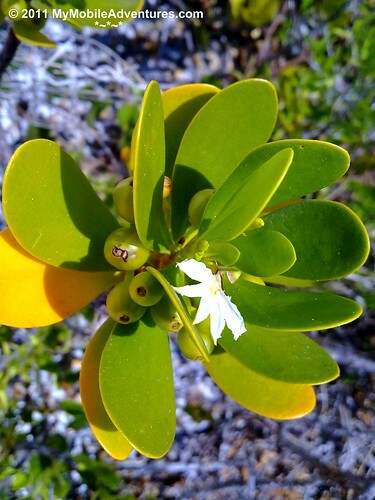 The inkberry (pictured) and it’s counterpart, the beach naupaka, have pretty similar configurations, including the berries while green and the flowers, which look as though someone had pressed them in between the pages of a book. 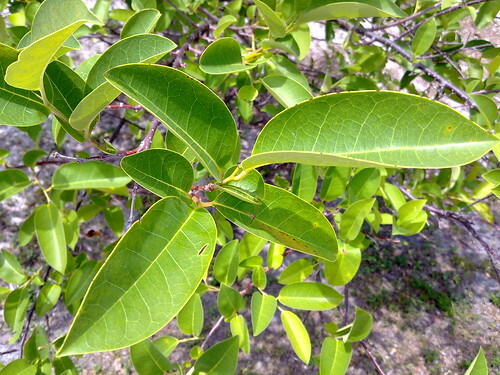 However, the leaves of the beach naupaka curl while the inkberry leaves do not. 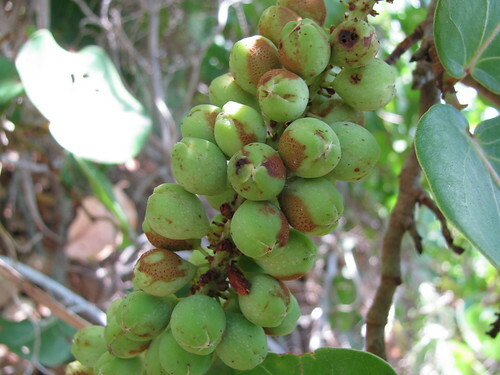 Inkberry fruits become very dark, looking like purple/black grapes; the ones pictured here will mature that way, while a beach naupaka’s berries will turn white. 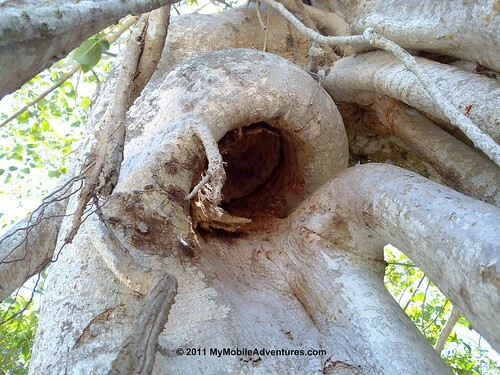 This is a strangler fig; looks like the “host” has long since succumbed to the treachery of its “guest”! These ficus trees are kind of like those guys in Corporate America who get to the top by crawling up the backs of their colleagues. 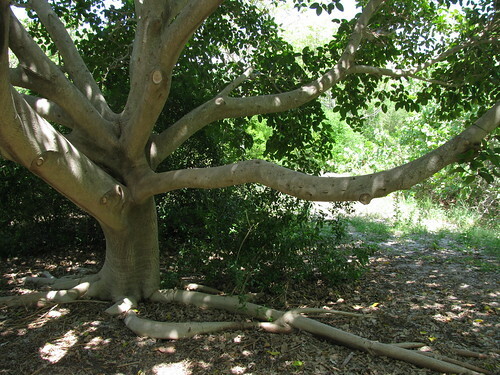 Stranglers germinate on a host tree, sending roots down and branches up. In an effort to support their climb toward sunlight, they “strangle” their host. 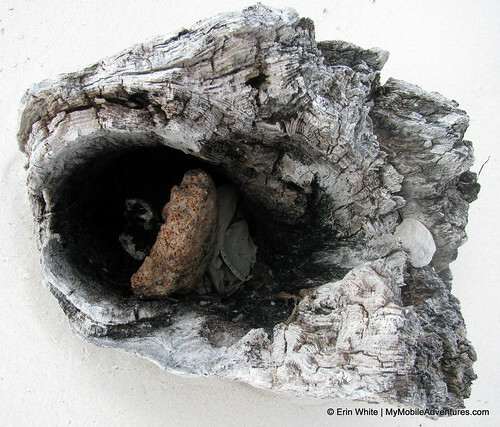 Here we see the hollow made where the host used to stand; you can see a bit of bark remains, but the rest has rotted away. 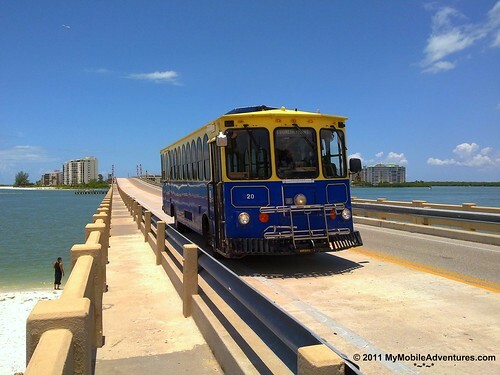 The beach trolley trundles its way across Big Carlos Pass. I like the foot/bike section on the bridge. It made me feel somewhat protected even as the vehicles went zipping by. These trolleys are a pretty efficient way to get around this area, especially during “season” when there are too many cars and not enough road down this way. 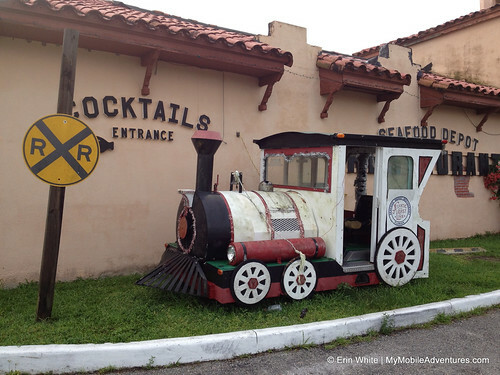 There’s even a starting point on the mainland – park your car at the Winn Dixie on Summerlin Road and in a little bit, a trolley will come by to collect you. This is the scene when you climb up the hill from the parking lot up to the foot/bike path on the bridge. 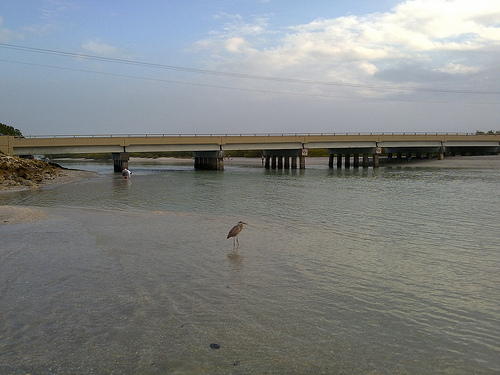 You can see the bayou off to the left, above the blue truck, and the beach where we did our seining and discovery of cool critters. Between the boat trip on Estero Bay and then this segment at the beach, everyone was some combination of hot, tired, wet, salty, sweaty, a little sunburnt and very happy by the time we were through. 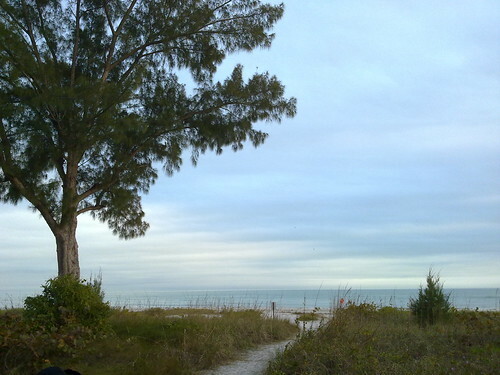 I proceeded to Sanibel Island after this, let myself into a friend’s house to take a shower and when she got home from a hunting expedition of her own (shopping! 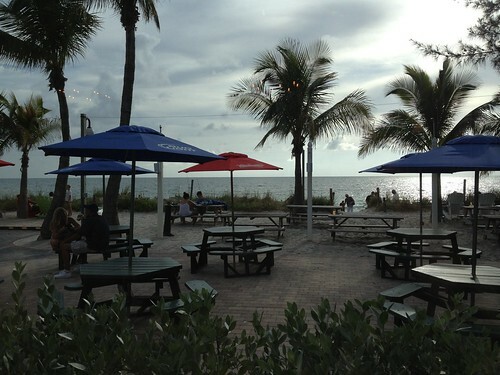 ), we went out for dinner with some other friends on the island. 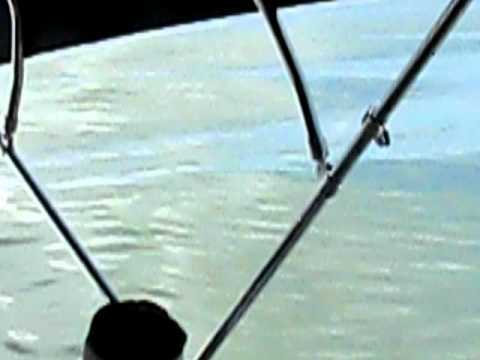 Here’s some bonus footage from the my field trip on Estero Bay with the Florida Master Naturalist program here in Lee County, Florida. 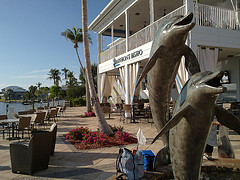 One of our classmates made up a song about the joys of Estero Bay and the dolphins seemed to love it. 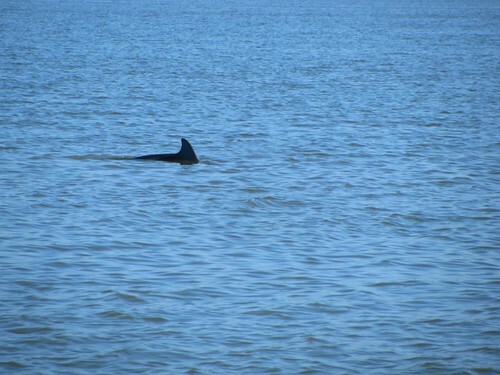 They ended up chasing our boat for a few minutes, leaping in and out of the wake as we sang our way toward the dock. Check it out in this video, below – Email Subscribers: if you do not see a video posted below this sentence, please CLICK through to the blog. 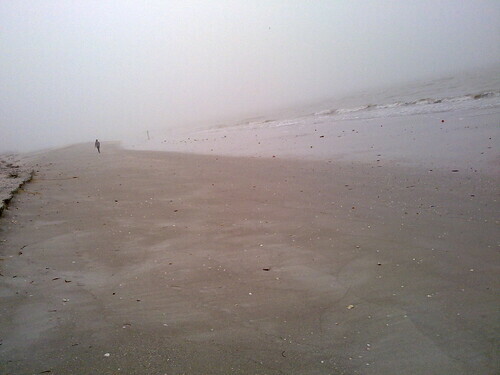 "Algiers" beach on Sanibel Island, originally uploaded by Erin *~*~*. 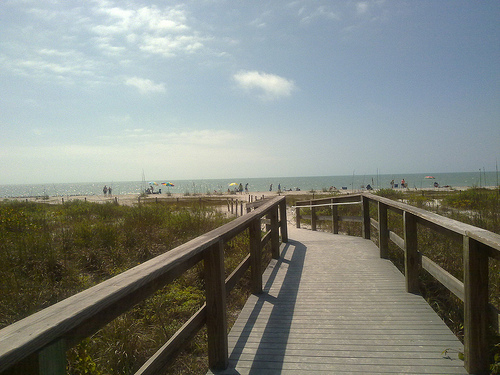 Very hot day in Southewest Florida but there’s an awesome sea breeze here at the beach. 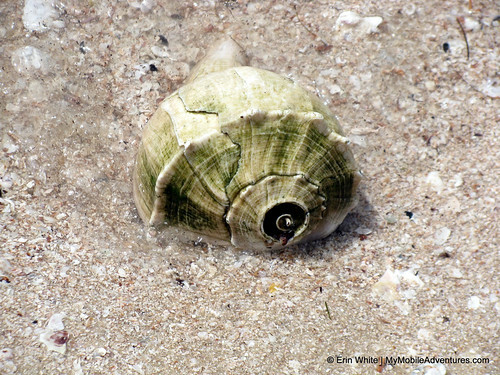 Really no shells to speak of. 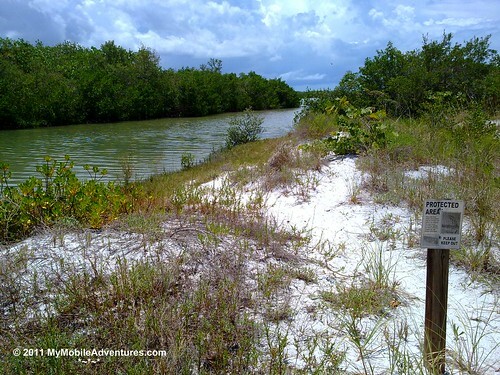 Today we’re continuing our exploration of wildlife and habitats in Estero Bay Aquatic Preserve with my Florida Master Naturalist class (Coastal Systems module). 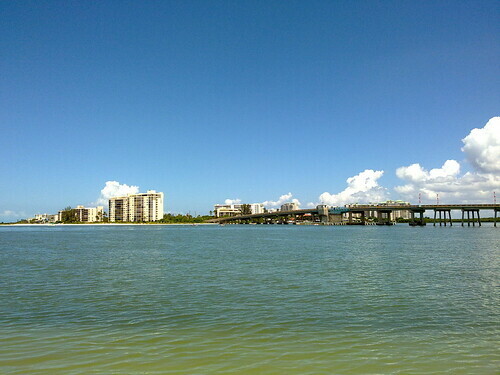 As mentioned in my previous post, Estero Bay is very shallow. 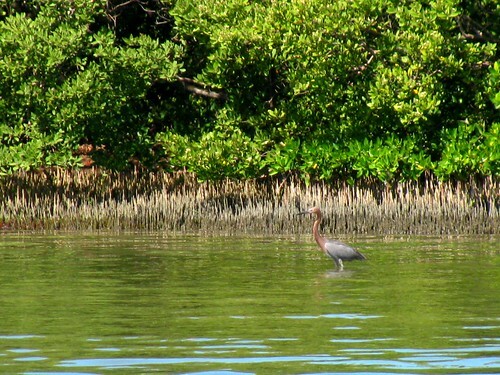 Sunlight penetration allows for the growth of sea grasses (they’re green, they need sunlight for photosynthesis), and sea grasses provide an excellent nursery for marine life, which in turn provides excellent feeding grounds for birds and bigger marine life. If you speed through and your prop tears up the grasses, then you’re destroying habitat and the whole ecosystem is compromised. 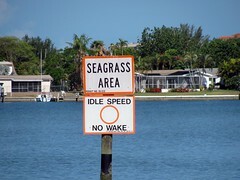 So, always pay attention to the “no wake” and “low wake” signs – they are there for a VERY good reason. 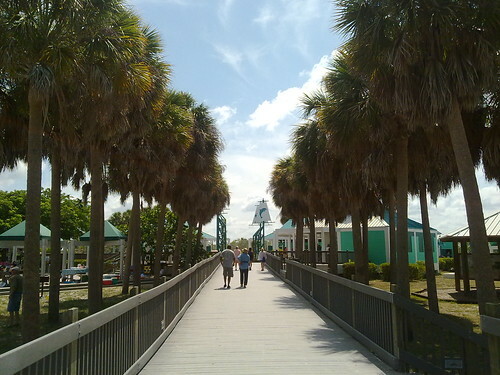 As we rounded a corner and emerged from under the Big Carlos Pass bridge, we saw tall high-rise buildings standing sentry over a stretch of unraked beach – kind of unusual, since beachfront high-rise residents usually want to see an unblemished expanse of sand, not dune vegetation. 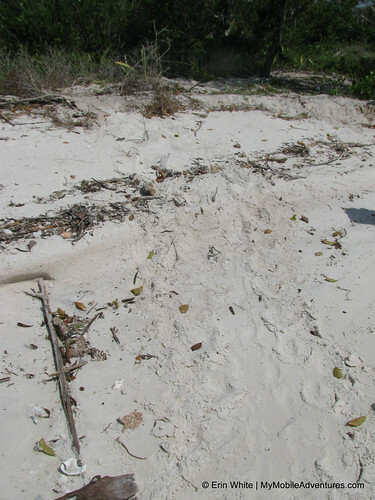 This beach is unraked because it is a bird breeding ground. While we were floating out here discussing the habitat, we saw two people haplessly wander into the breeding ground and get dive-bombed by the birds defending their territory. It was a perfect example of this type of protective, territorial behavior. The people ran for cover; I think they were probably totally innocent and didn’t realize where they were. We could hear the leader of this tour speaking to the group; they might have been eco-tourists too, just like us. It’s actually fortunate that we took this ride in June. 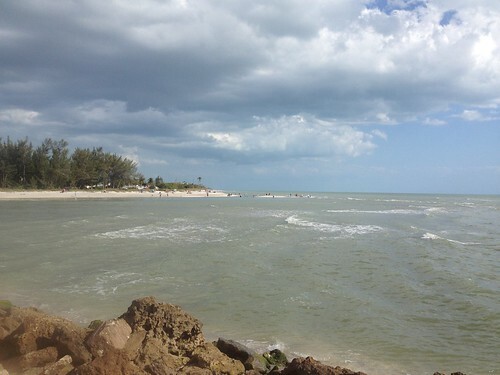 During “season” here in Southwest Florida, these waters would have been pretty well jammed with all sorts of recreationists. 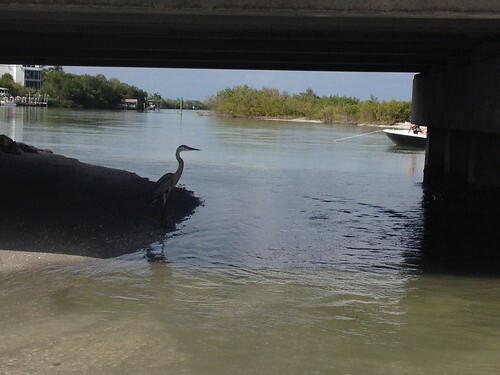 FLYING IN ESTERO BAY ?!?!?!!? 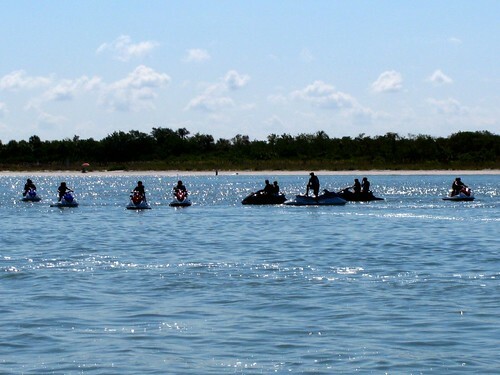 No sooner had we taken leave of the jet skiers and headed out of Big Carlos Pass then we saw this … I’m not sure what it is but it looks like fun! 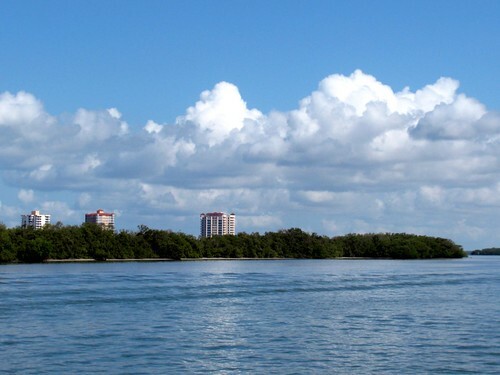 It’s a regular water sports and recreational paradise down here in Southwest Florida. I believe we are now heading into what our intrepid boat captains referred to as “Spoon Lagoon”, the location of which we swore never to reveal. I’d tell you, but then I’d have to kill you…. It’s called “Spoon Lagoon” for reasons that will become obvious soon. 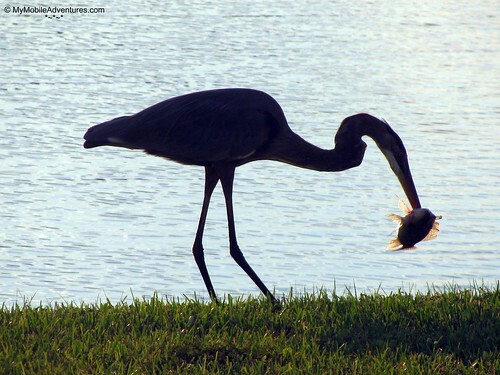 This is a tricolored heron. 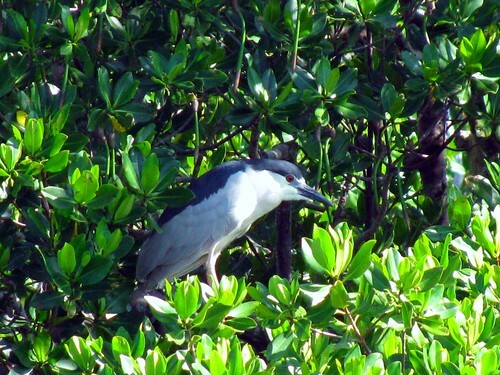 You might be thinking, “Hey wait a minute, didn’t she just tell us that kind of bird was a little blue heron?”. Nope, I didn’t. See the white underbelly? Not a little blue! Here’s a sight I love, although I haven’t quite figured out why yet. 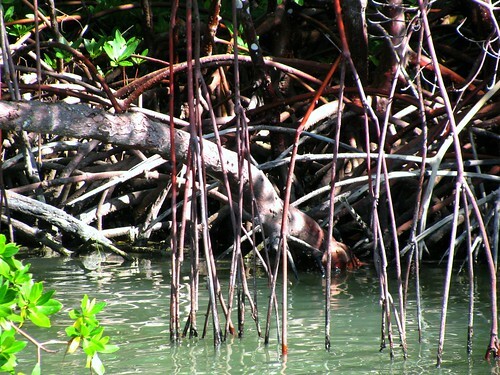 This tangled mess is actually a the prop root system of the red mangrove tree. It’s a vast and intricate network, like a very complicated work of architecture or sculpture. I just get lost looking at it, and not unpleasantly so. Well, as it turns out, the prop roots ARE somewhat of an architectural feature. They serve as braces for the tree, to hold it up. 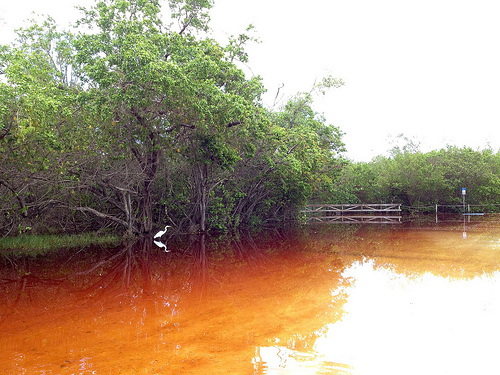 They also collect and hold sand and silt, so an island forms under and around the mangrove. Finally, they pipe air down to the actual roots of the tree. Pretty useful, huh? 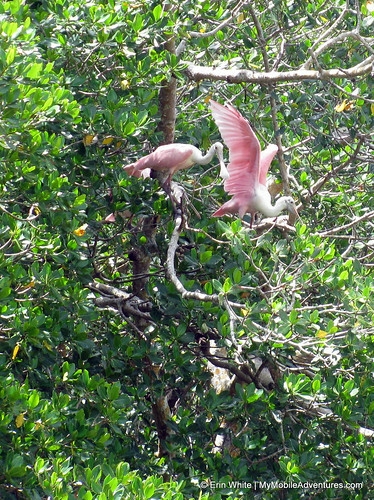 And now we come to the rhyme and reason of naming “Spoon Lagoon” – it’s the roseate spoonbill, which our captain has known to hang out in this particular spot in the bay. 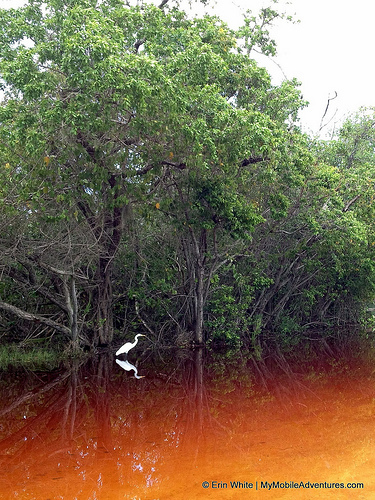 Along with our spoony friend is a white ibis. 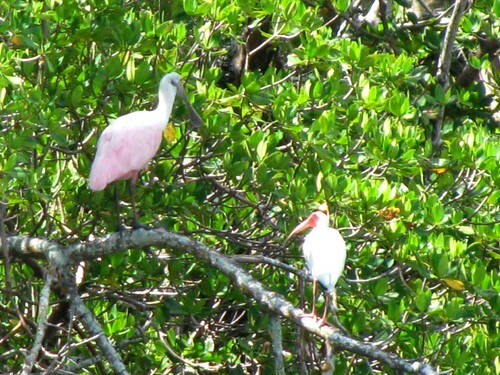 The spoonbill uses it’s bill to sweep along the mud for delectable morsels to nom-nom-nom, while the ibis has a bill more appropriate for probing down into the mud. 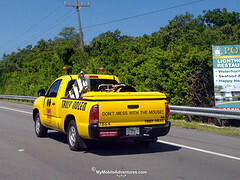 Sights such as this one are common in Florida. 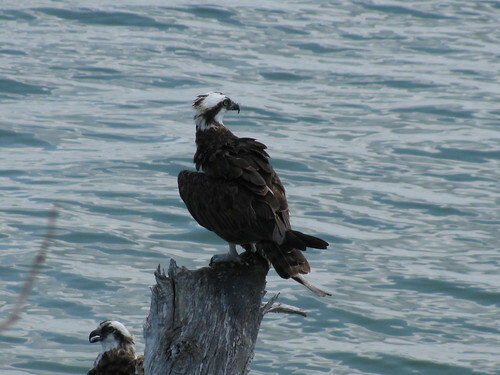 As habitat is lost, the osprey often improvise, as we have seen previously with the nest on top of a channel marker sign. 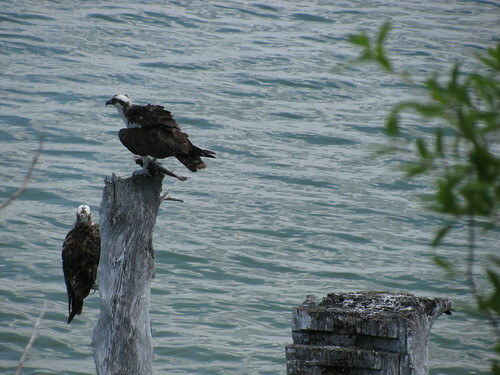 They are also frequently given a perch like this one. You see these platforms a lot along a certain stretch of the I-4 interstate, where the birds had been building on poles close to dangerous power lines. The chicks would fall out and fry themselves. 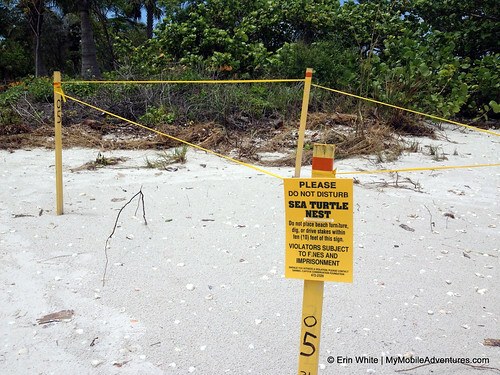 Conservation groups come along and build these platforms to encourage a safer location for the nests. 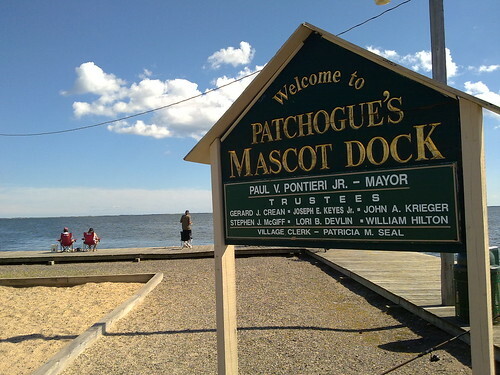 I’ve also seen these man-made perches back home on Long Island, specifically in the area of the Connetquot River in Oakdale, NY. It’s kind of cool – like building a bird house, only open-air. 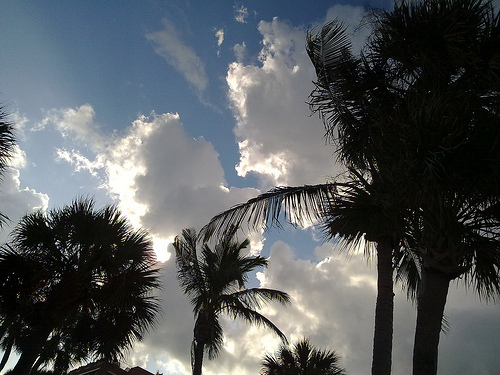 I am in love with the Southwest Florida sky. 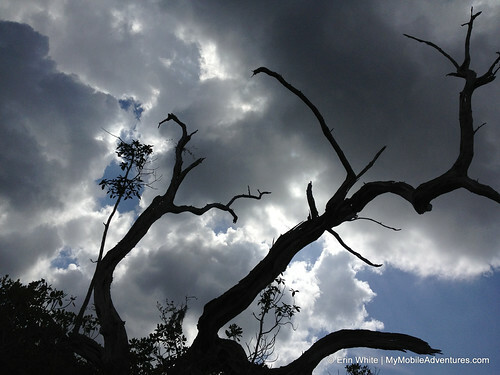 Clouds are endlessly fascinating to watch as they morph and change before your eyes. I am so lucky to live here, and I know it. 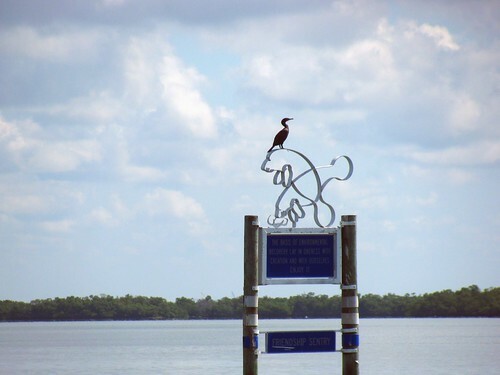 Our friend the cormorant strikes a regal pose atop the manatee sculpture that sits on a sign,which says: “The basis of environmental recovery lay in oneness with creation and with ourselves. 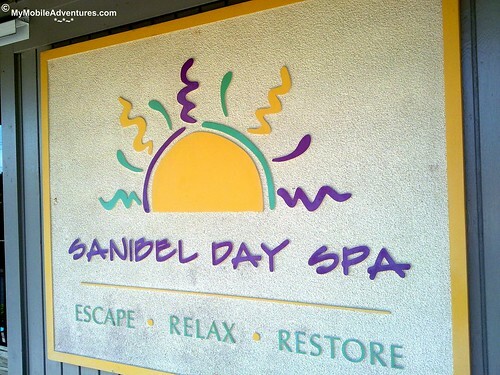 Enjoy it.” The sign below it says, “Friendship Sentry”. I guess the cormorant is taking his job seriously! 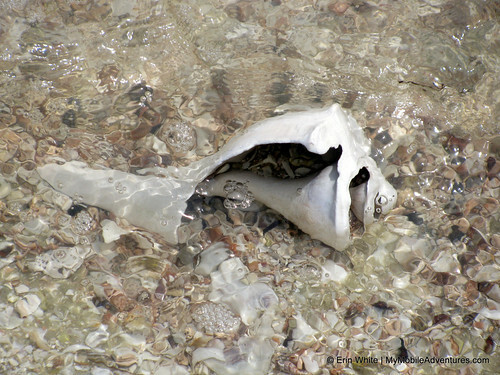 On June 18th 2011, my Coastal Systems Module class in the Florida Master Naturalist program embarked upon their second field trip. 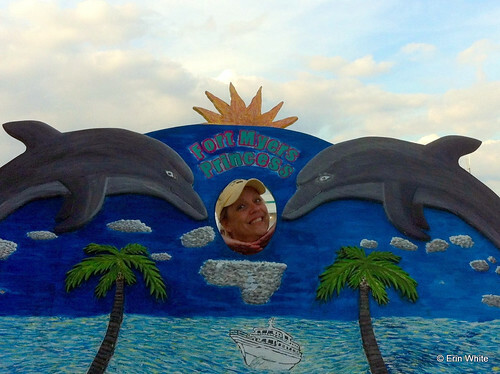 This time, we started from Snook Bight Marina on Fort Myers Beach and hopped aboard a sturdy vessel as the guests of Good Time Charters. 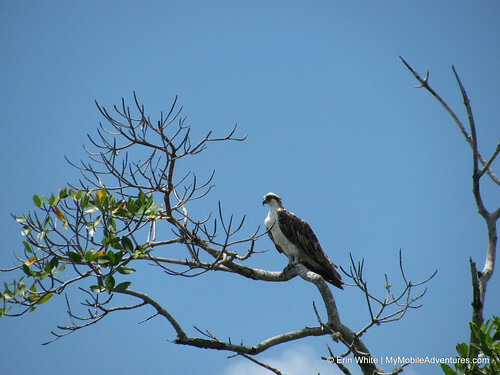 We were fortunate to have Captain Mike, Captain Cristina and Captain Dwight all in our class, and found them to be excellent and knowledgeable guides for our “three hour tour… a three hour tour….” We had a beautiful sunshiny day for this adventure and the wildlife did not disappoint. There was some speculation that Captain Mike paid them all to show up 😉 Well, if that’s true then it only serves to prove what clever wildlife tour guides those people at Good Time Charters really are! 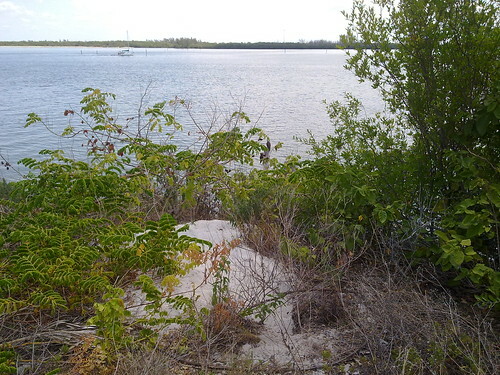 Estero Bay Aquatic Preserve is the first aquatic preserve designated in the state of Florida (1966). The bay is extremely productive and contains elements of historic (and even pre-historic) significance, some of them submerged. 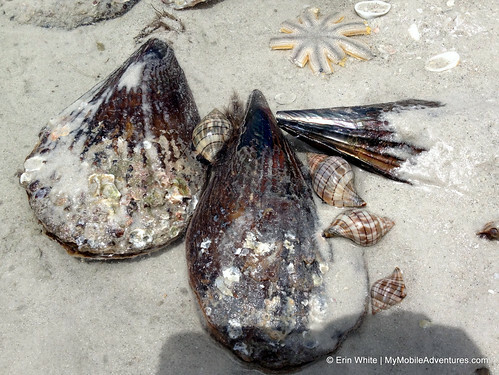 A wide diversity of marine life starts out in the grass beds “nursery”. 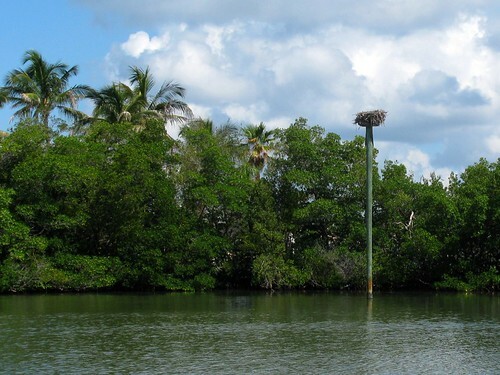 The environment is also ideal for rookeries, colonies of nesting birds who breed and raise their young on the many islands that dot the bay. 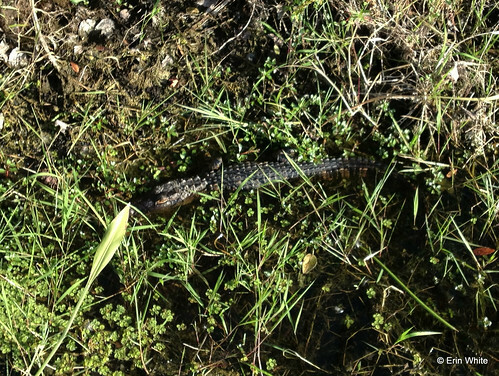 Here are a few of the critters we managed to encounter on this adventure. 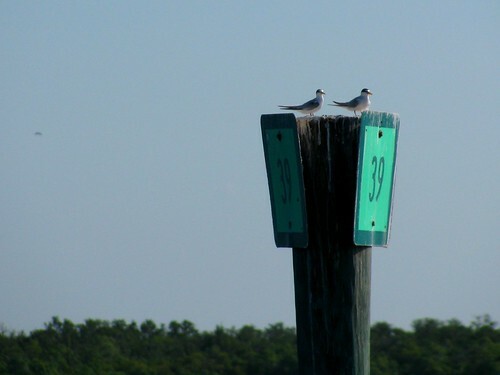 Least terns are picky about who hangs around their nests. If you walk through their nesting area, they will dive-bomb your head. We would witness this phenomenon later in the trip near Big Carlos Pass. Hard to catch these guys in action; you see them, get the camera on the spot where they WERE and they have already submerged, only to resurface somewhere your focus ISN’T. 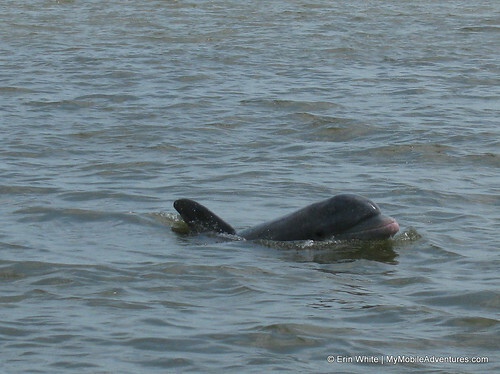 One of my many field guide books calls them “toothed whales” – as opposed to baleen whales, who have food filters instead of teeth. I think this might be a Wilson’s Plover but I can’t be sure because I cannot really see what color the legs are; if they are tan, then it is probably Wilson’s. 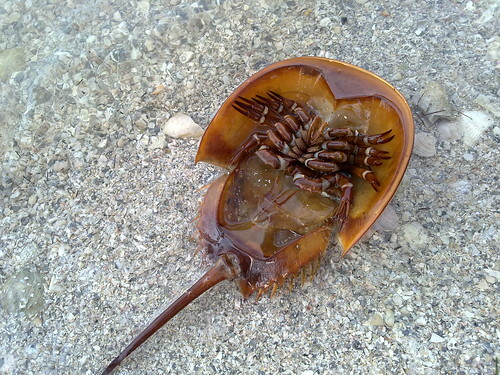 They like to eat fiddler crabs. The way to tell a cormorant from an anhinga is to examine the beak. Does it look like it’s good for spearing, or for tearing? This guy, looking very statuesque, has a hooked beak, so it’s good for tearing – and that means he is a cormorant. 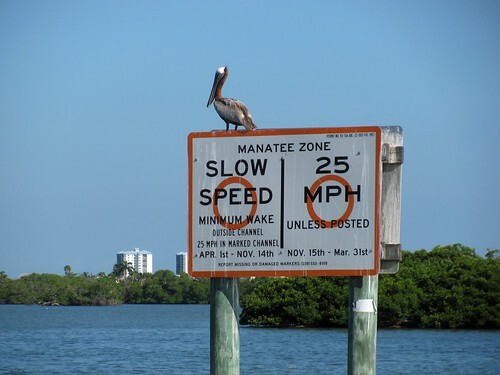 BROWN PELICAN and SLOW DOWN! 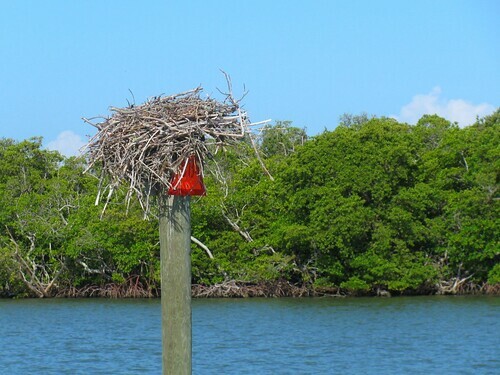 Adaptive behavior – in the absence of tall trees, osprey will commonly build their nests on man-made structures such as light poles, tall buildings and yes, channel markers like this one. 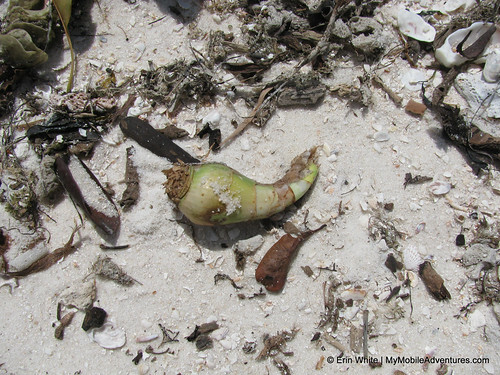 Saw lots of this type of adaptation in Rookery Bay too. While observing wildlife, always remember to maintain a respectful distance. You don’t want to get close enough to interrupt their natural behaviors. Another good reason to keep your distance – if you’re in a boat, you risk running aground! 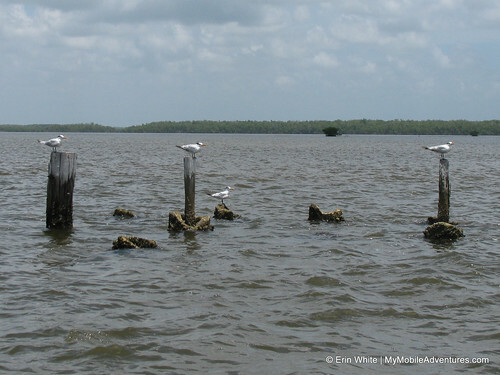 We were advised that if you fall overboard in Estero Bay, the first thing you should do to save yourself is… stand up! It’s only a couple-three feet deep out there, which is part of what makes it a great breeding ground. 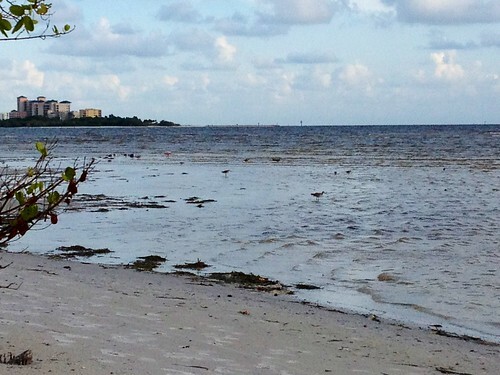 Those are brown pelicans on the far sandbar, an osprey flapping around taking a bath in the middle, and an egret (can’t tell which – from the “fuzzy” head, I’ll guess snowy egret) hanging out in the foreground. 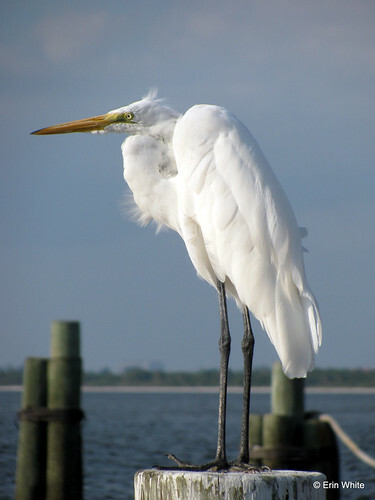 I see another egret behind the prop roots, too – looks taller, my vote is great egret. 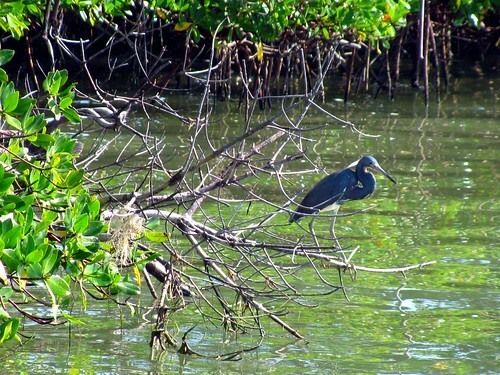 The class on the boat spent a bit of time trying to identify this bird from afar. 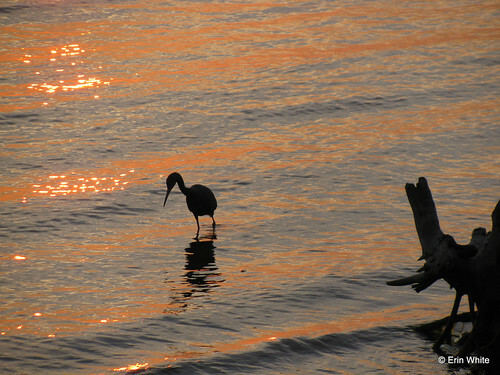 Sometimes the colors can be deceptive in light reflected off the water. 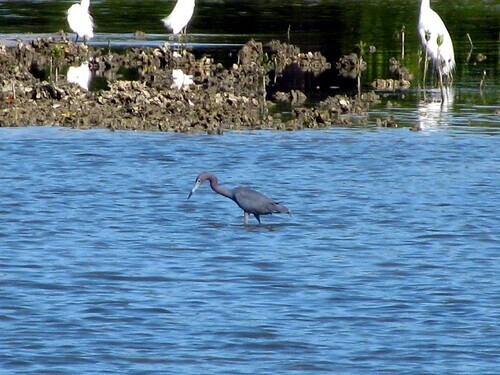 In the end, we determined via binoculars, zoom lenses and getting a bit closer that he was indeed a little blue heron. 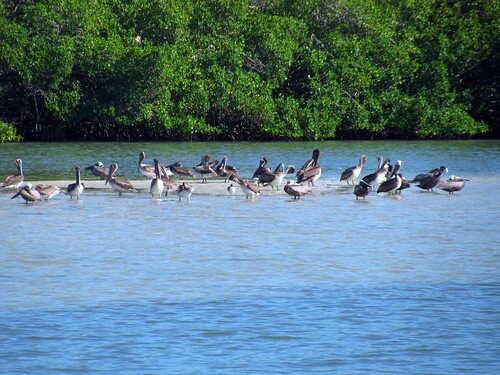 Here’s a closer look at the flock of brown pelicans at rest on a sand bar. NEXT TIME: More cruising, more critters and a surprise musical performance! 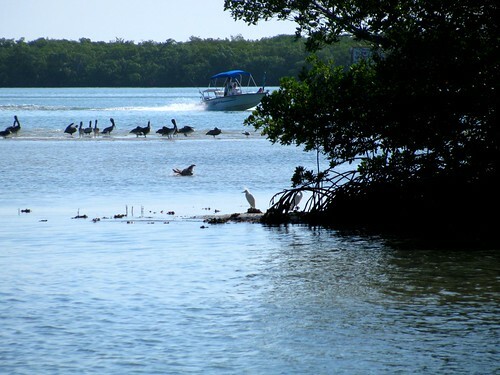 This is the final installment of my first field trip with the Florida Master Naturalist class (Coastal Systems Module). 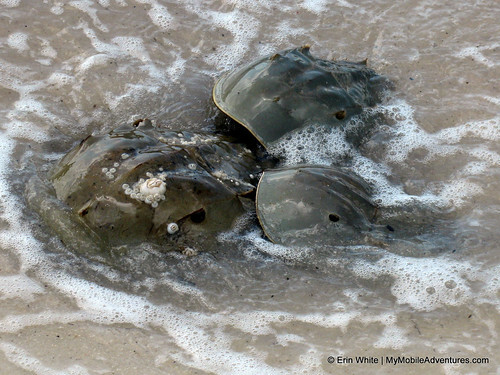 Last time, we explored a few critter encounters at Bowditch Point. Now we’re going to continue on our journey over the hill, through the dunes and onto the beach. The day was getting pretty warm, and a few of the plants had an “aromatic” (translation: unpleasant!) odor. 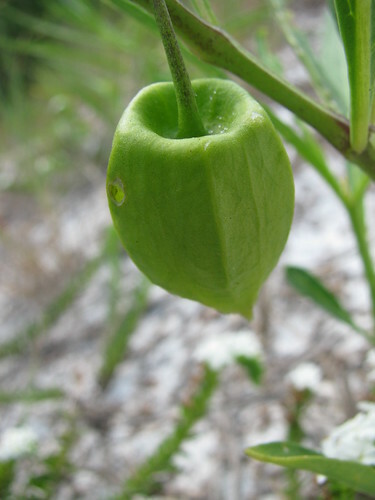 I believe it was the plant described to us as a “stopper” plant, used by the Calusa natives once upon a time to make a purgative drink. 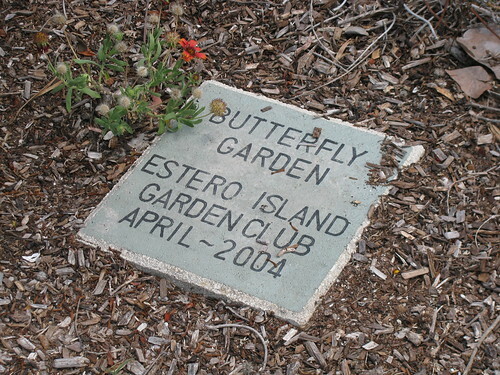 The Estero Island Garden Club created a butterfly garden at the top of the hill. 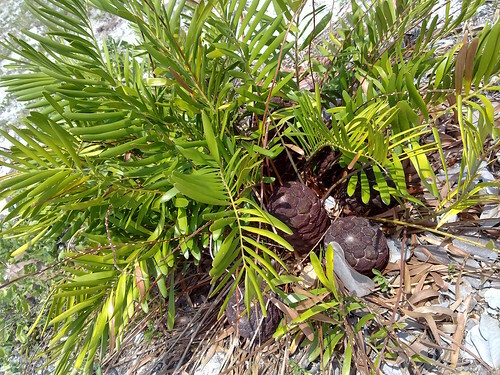 There are a lot of coontie plants at Bowditch Point Regional Park. I believe this one is a female. The cones are shaped differently for a male. 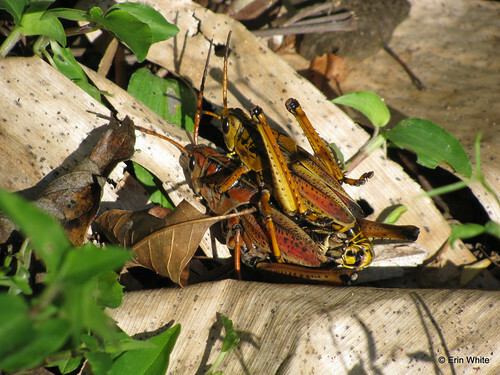 No I’m not kidding – male and female! This is called a dioecious plant – that’s Greek for “two houses”, and it means that the plant is either a male or a female. 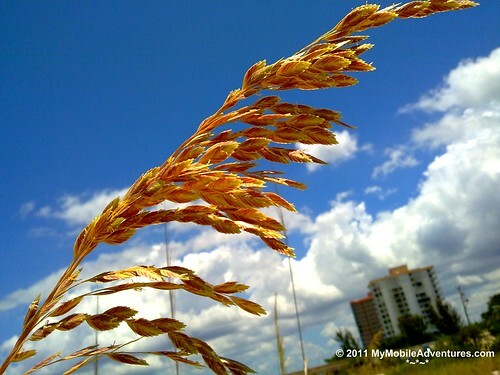 The Seminoles dried and ground the roots into flour and made it into bread. 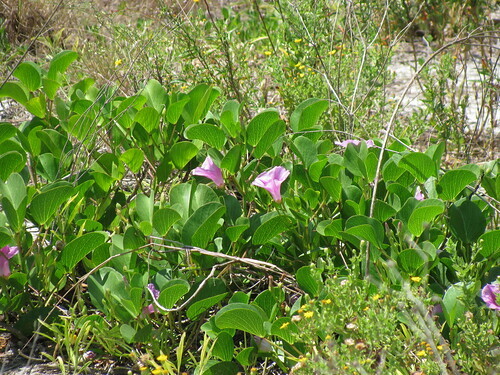 I’ve heard it referred to as arrowroot too, but there’s another plant called that… confusing, the world of botany! I guess that’s why people like to use the Latin names. There are no mistakes when you stick to the Latin names. So I’m told! 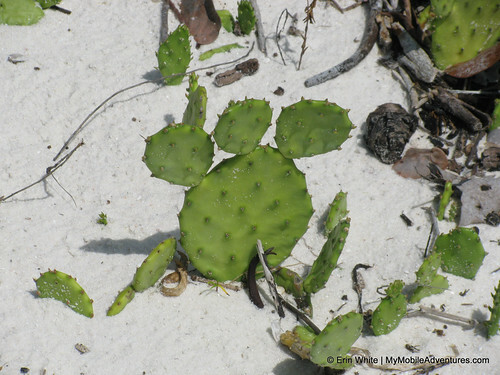 You’ve heard of it all your life and now you’ve met one – it’s the prickly pear cactus! A few years back, I saw some of these fruits for sale in Publix but didn’t have the guts to try them. One of our classmates said he’s tried them and he felt great after a few days of eating them – I think they have anti-oxidant properties. 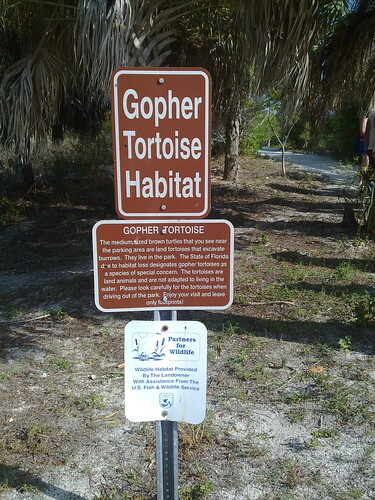 Anyhow, the tortoises love ’em so they can’t be all bad, right? 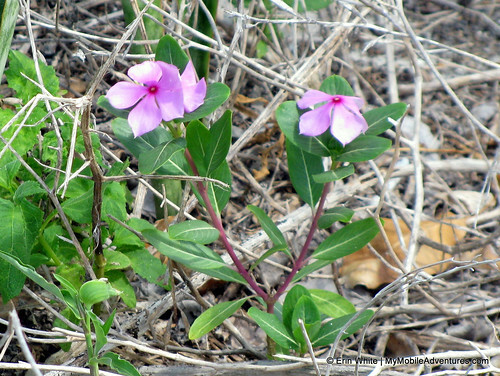 Railroad vine is related to morning glories and so is their behavior – they are open during the day and close up once night falls. 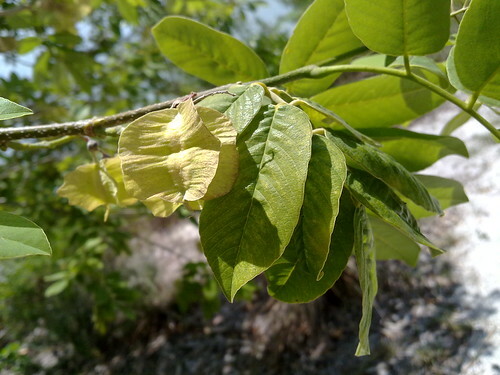 The Latin name, ipomea pes-caprae, relates to the shape of the leaves. Google Translator is telling me “foot she goat”, so I guess the leaves are supposed to look like a girl goat’s hooves (so what do a boy goat’s hooves look like, then?). Sea grapes grow in a bunch but you can’t really pick ’em that way. They don’t mature/ripen as a bunch; they are individuals and each decides in its own time when it is ready to be ripe. That’s why you generally see only some missing from a cluster; the other ones weren’t yet ready to eat! This tree is called the strangler fig. It’s less than 20 years old and stands pretty much on the crest of the hill, spreading shade in a wide swath. 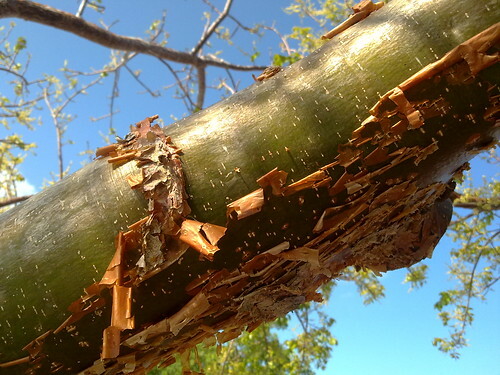 Migratory birds like to stop and rest in this tree, for the fruits are nice to eat. The seeds are spread around via bird poop. Sometimes, the poop lands on another tree, where the new baby strangler latches onto and eventually envelops the host. As you can see, they have a pretty aggressive root system, too. I find it funny that one of my Florida landscape plant books identifies companion plants for the strangler; I’m fairly certain it’s just going to kill all its friends so I’m not getting the point…..
Well, here’s at least one friend that the strangler won’t bother to strangle – a coontie grows low and spread out in the considerable shade. Our guide pointed out how different it looks from the ones in full sunlight. It definitely looks to me as though it is reaching around to find some sun. This plant has so many names, where do we begin? Chinese lantern, common ground-cherry, husk tomato (I’m told it tastes like a tomatillo), sand ground-cherry, bladder cherry (it floats)… a lot depends on where you live, I guess, when it comes to common names. 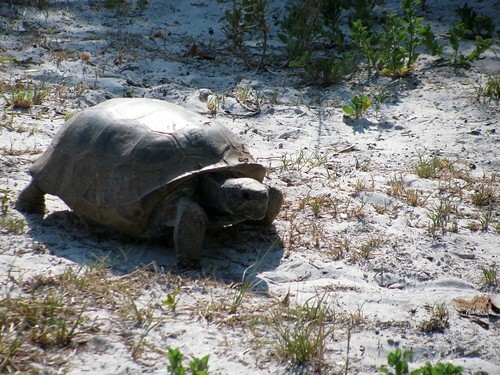 Gopher tortoises like to eat these, too. 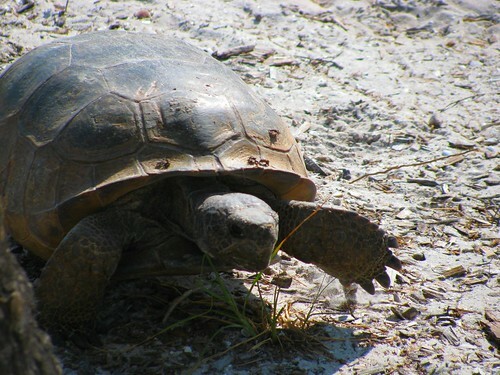 I guess it makes sense – it’s certainly low enough for a tortoise to munch upon. 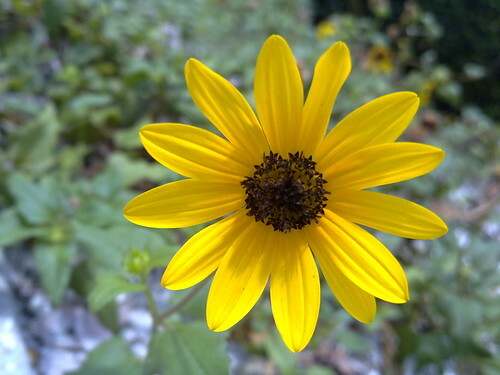 These daisy relatives are called dune sunflowers. They pop up basically everywhere in the coastal system and they flower year-round, with just a bit of a break in the winter time. They are also related to Indian blanket flowers. 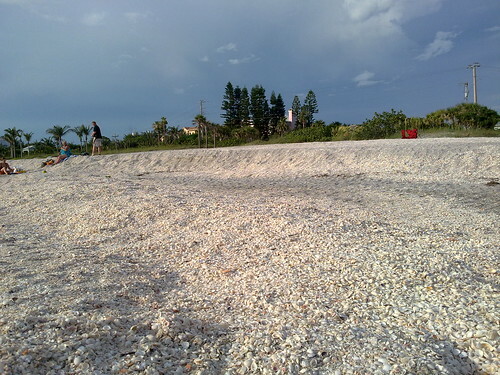 Because of the way the tides flow around this area, Bowditch Point gets eroded and the sand is carted away by the sea. Periodically, the government will decide that “renourishment” is in order. The get a barge and a bunch of pipe, park the barge out in the bay and pipe in sand from “out there” somewhere. On the one hand, it’s intrusive to the environment and counter to what Mother Nature seems to want. 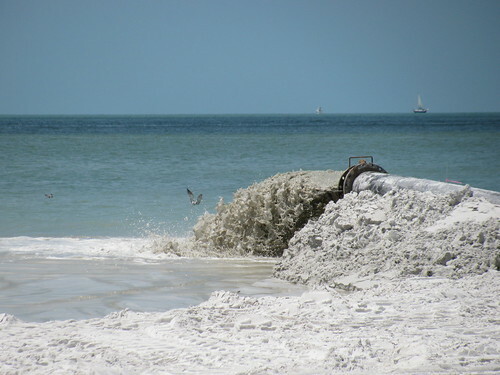 On the other hand, Lee County is pretty dependent upon tourist dollars and cannot afford to have any of their public beaches get washed away. I checked this out pretty thoroughly before determining that the pipe was NOT bringing in quantities of good shells. Then I headed for the parking lot. There’s a shower and a foot sprayer behind me; to either side are little picnic areas and pretty flowers. It was a long morning and it was getting REALLY hot. 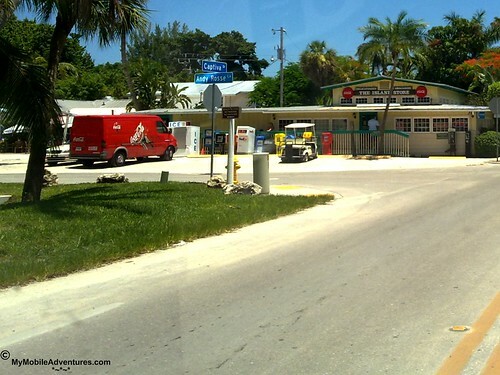 I decided I was ravenously hungry and proceeded to meet friends at Jerry’s on Sanibel for lunch before heading home. Thus endeth the first field trip – but fear not, there’s more where this came from – stay tuned! 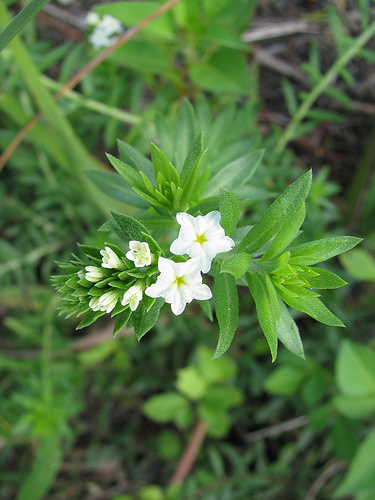 These are TINY flowers on a plant found at Bowditch Point Regional Park on Fort Myers Beach, Florida. The people we saw photographing these identified them merely as “heliotropium” so I had a tough time isolating it even with a bazillion books at my disposal. 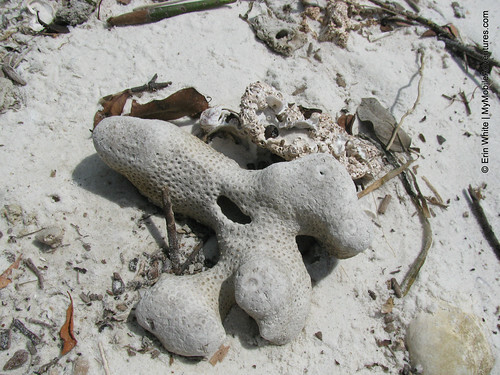 Finally found it at this site: www.regionalconservation.org/beta/nfyn/plantdetail.asp?tx… – and found it interesting that on the east side of South Florida, they are yellow, but here on the west coast, they are white, as pictured. So it’s actually a Pineland Heliotrope but I’ve also seen googled pictures identify it as a “seaside” heliotrope. 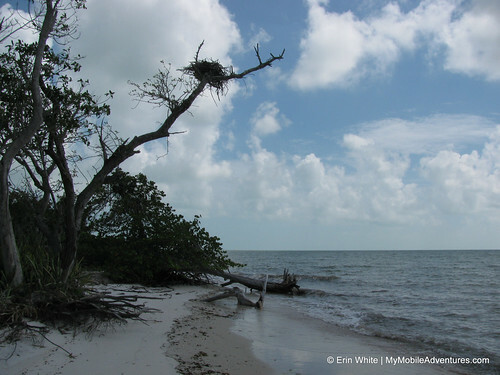 This post will pick up where Wilderness At Bowditch Point left off. We’re on a field trip with my Florida Master Naturalist class (Coastal Systems Module), and we’ve got a really great guide named Roger Clark, from Lee County, Florida’s Conservation 20/20 program. 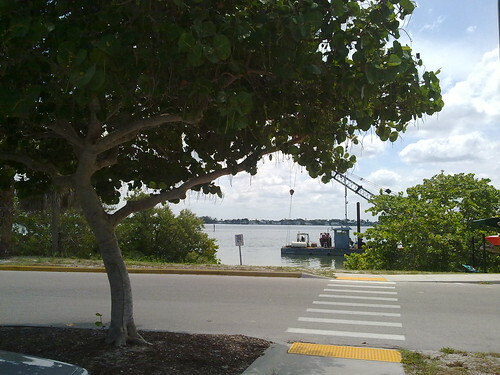 After telling us about a few of the plants and trees that we found growing on the perimeter of the parking lot, Roger led us up the man-made hill at the very northern tip of Estero Island aka Fort Myers Beach. Once on top of the hill, we saw a prominent “KEEP OUT” sign posted on a split-rail fence. 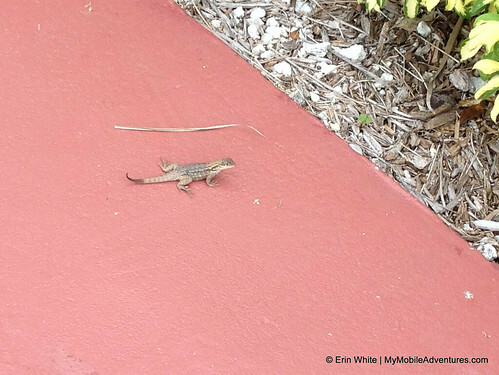 Almost immediately, it became apparent that we were in for a critter encounter! 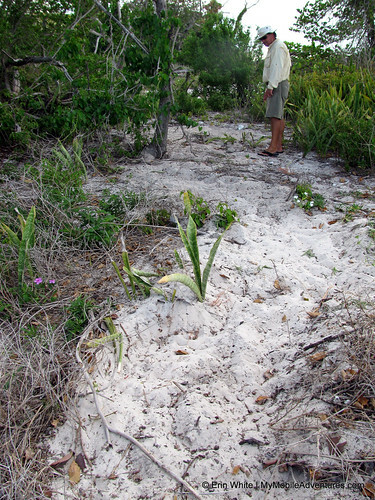 If you are looking for a gopher tortoise burrow, here’s how to spot one – just look around for a heap of sand that looks like an ant hill on steroids. The ones I’ve seen come complete with a hole that’s partially obscured by brush. I don’t know if that’s intentional, or just one giant co-inky-dink. 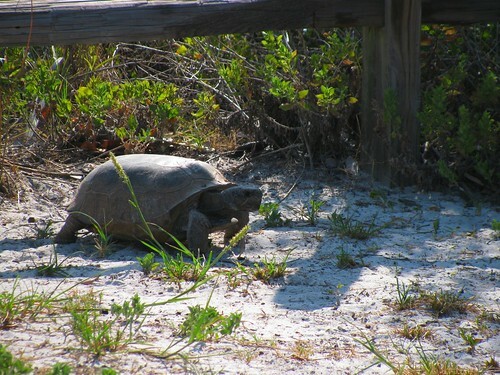 A female gopher tortoise contemplates jumping the fence. Whut-oh! Stand back, she’s on the move! 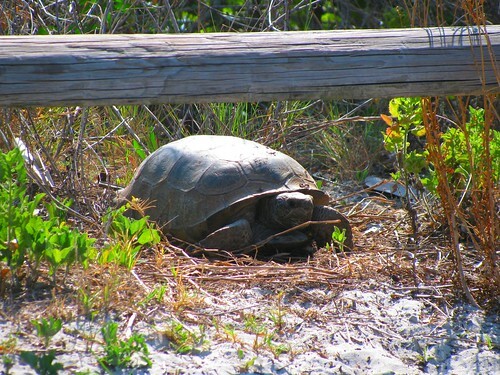 This tortoise had a single-minded mission to leave her burrow and head into a scrub area, and no wildlife geek with a camera in her hand was going to stop her! I can’t believe I moved out of her path, and then she headed right for me anyway. You can hear one of my classmates coaching me (translation: playing with my head a bit) about how vicious these animals can be 😀 You can also hear him say “no” when I ask if I should move. In the end, I was running out of options to keep the lens on her and had to stand up to avoid becoming a pretzel. You can also hear scrub jays screaming in the background about the time I stand up. 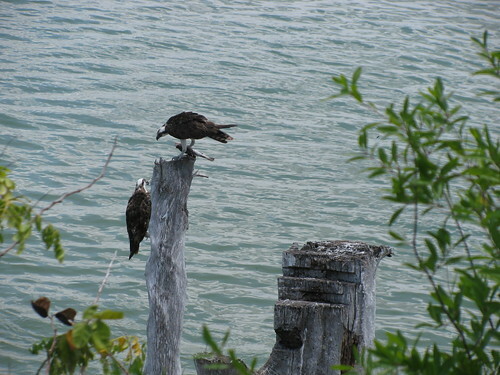 At first, I thought this osprey had an extra tail, or maybe one of her feathers was coming loose. Now we see that it’s definitely a tail, but it’s not hers. It’s lunch! I think this is what they call “mantling” behavior, where they hunch over their food so that nothing flying overhead will see it and try to compete for it. 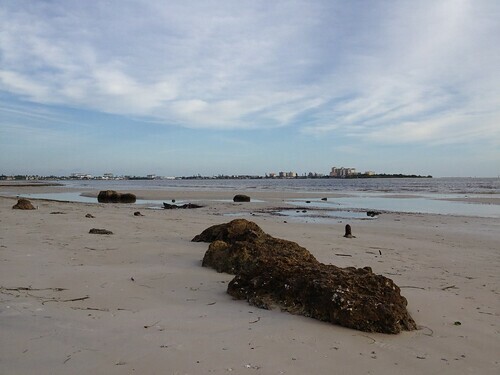 For our first field trip, my Florida Master Naturalist class (Coastal Systems Module) went on a botanical exploration of a small wilderness located at the northern tip of Estero Island in the town of Fort Myers Beach, Lee County, Florida. 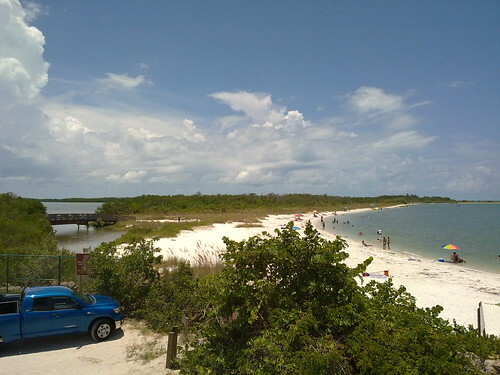 This is Bowditch Point Regional Park, part of the Lee County park system. 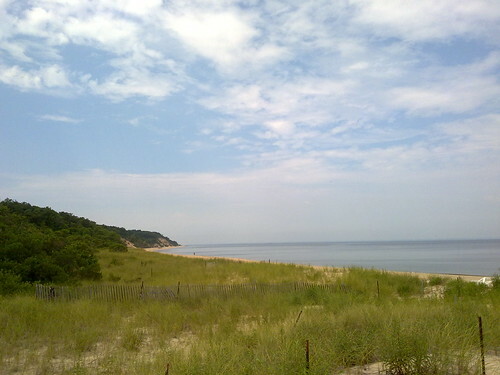 The site had been used as a repository for channel-dredged sand, and is consequently the highest point on the island at 22 feet. The land changed hands several times over the years until the County had the opportunity to purchase it in December 1987 for $5.75mm. 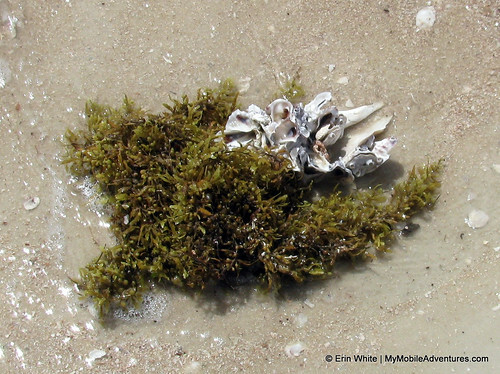 Since that time, much effort has gone into the creation of a natural coastal habitat where native Floridian plants can thrive and wildlife can find refuge. Our guide for this trip was Roger Clark from Conservation 20/20 here in Lee County. He was patient and knowledgeable and had a unique way of conveying information about a plant or animal; he’d first tell you some facts and attributes and THEN tell you the name. It was kind of like Jeopardy – first you get the answer, and then you get the question. 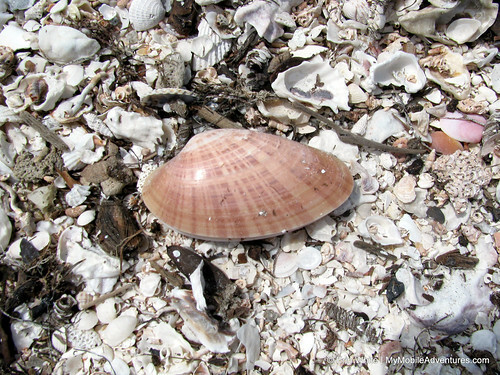 Roger had a field guide with him which he recommended to the rest of us – Florida’s Living Beaches: A Guide for the Curious Beachcomber . I stopped at Barnes & Noble on the way home and they had ONE left, so I quickly purchased it. I also found it on Amazon. 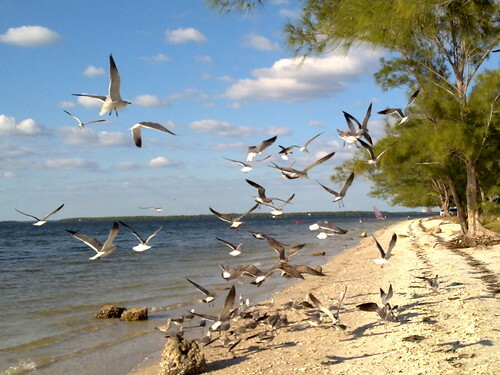 The other book I like to use is the National Audubon Society Field Guide to Florida . It’s the typical slim, easy-to-pack-and-carry Audubon volume, and it’s great for just general identification while you’re out and about. I’ve got the paperback, which seems to be in short supply these days, so that’s a link to the hardcover edition. Notice how specific this sign is – couldn’t be plainer. 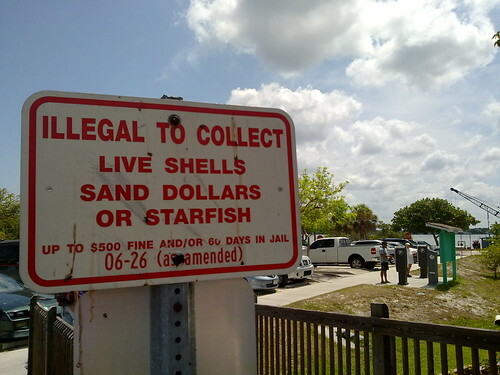 I’ve seen similar signs at all beaches in Lee County, yet I’ve also seen people violating this law 🙁 Most folks, however, are conscientious about it. 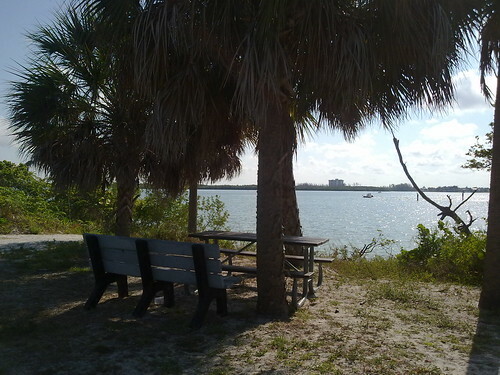 At the bottom of the “mound”, just where it meets the parking lot, there’s a nice little shady spot to sit and enjoy the view of Matanzas Pass. The word “matanzas” is Spanish for “killings”. 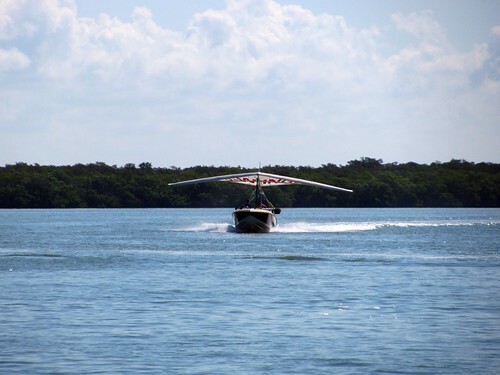 History tells us that the indigenous people who once lived here, the Calusa, had a habit of paddling out to meet Spanish explorer’s ships while extending a special kind of welcome with the business-end of their spears. Indeed, Spanish explorer Juan Ponce de Leon met his fate from a mortal wound received at the hands of the Calusa. 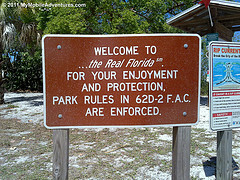 There’s speculation that Matanzas Pass is the place where a lot of these “welcome”-type activities occurred. 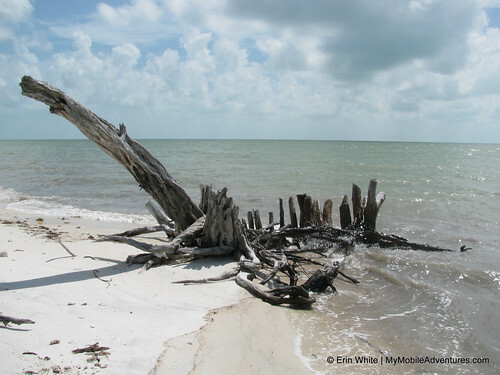 What do the gumbo limbo tree and the Florida tourist have in common? They are both red and peeling… ha ha ha ha ha 😉 Migratory birds like the fruit of the gumbo limbo tree. We’ve got lots of these trees here in Southwest Florida. 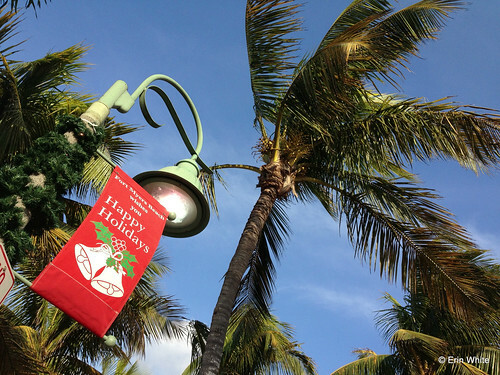 I was surprised to find out that palms aren’t really “trees”; they lack a vascular system. The smaller trees in the swale are pond apples. They were planted there because they can well tolerate having their feet wet. 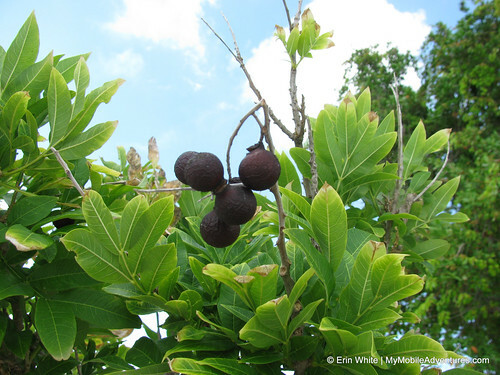 Pond apples have compound leaves – more than one leaf attached to the same leaf stalk. The apples are edible by animals and humans but they don’t taste very good, I’m told. 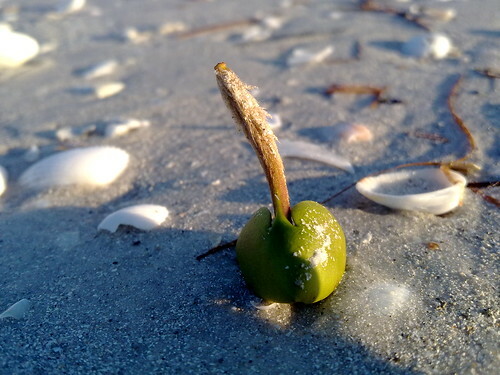 The sea grape wants to be a tree! 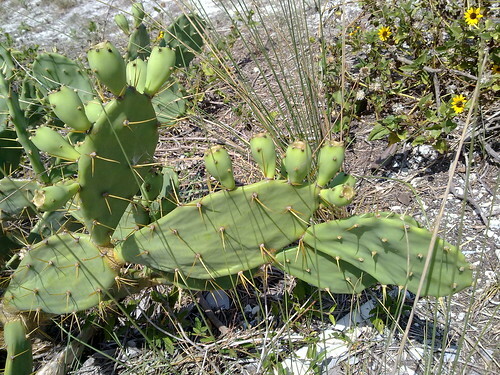 However, many people chop at them to keep them shrub-like. They are used in landscaping as hedgerows and borders. This one was allowed to be a tree. During this field trip, we found out that there are ANSI standards for pruning trees and that one should NEVER “top” a tree. ANSI standards? Who knew?!?!! 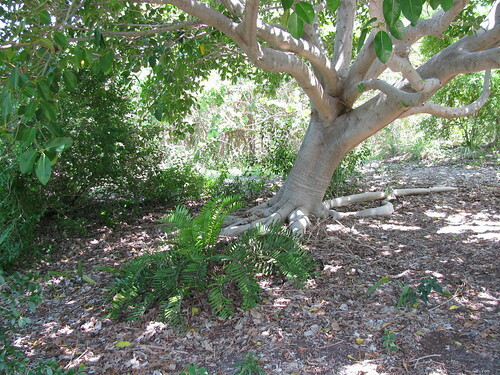 This Jamaica Dogwood is otherwise known as the Florida Fish Poison tree. 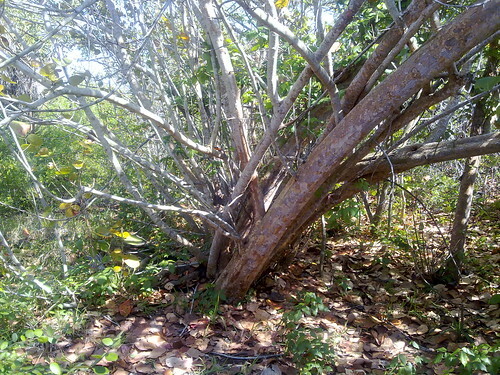 Powder made from the tree can be used to stun fish, making them more easily captured. We’re about to continue up the hill and catch a glimpse of some of the residents. OK, WAY more than a glimpse! Stay tuned – PART TWO of this field trip will be posted in a few days! Standing on Lovers Key, originally uploaded by Erin *~*~*. That’s the Big Carlos Pass bridge. We are starting to seine now. Diving for their dinner, originally uploaded by Erin aka Tink*~*~*. The Ohioans who got there before we did, originally uploaded by Erin aka Tink*~*~*. 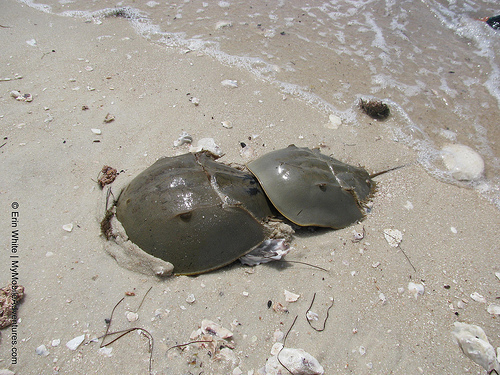 We went to find the other one on Bowman’s Beach and these nice people had gotten there before us. Please don’t let there be snakes, originally uploaded by Erin aka Tink*~*~*. Worn-out sea-faring traveler, originally uploaded by Erin aka Tink*~*~*. 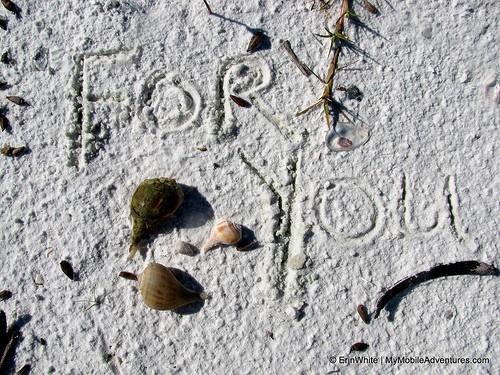 Memo in the sand on Sanibel Island, originally uploaded by Erin aka Tink*~*~*. 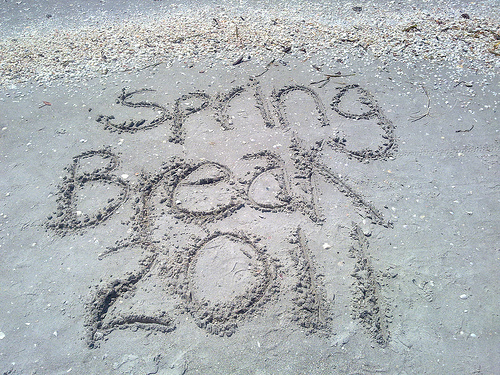 Beach day on Sanibel, originally uploaded by Erin aka Tink*~*~*. Heron, originally uploaded by Erin aka Tink*~*~*. Blind Pass is nearly CLOSED! Blind Pass is nearly CLOSED!, originally uploaded by Erin aka Tink*~*~*. Mother Nature will not be denied! 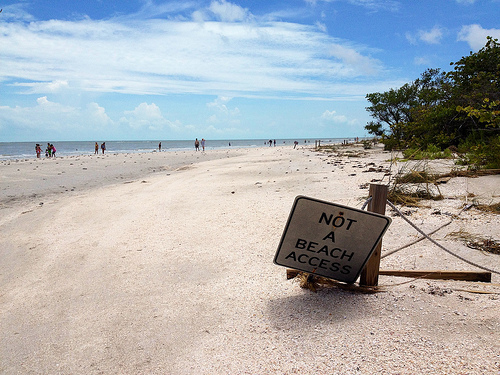 Sanibel access 5 – most negative low tide…, originally uploaded by Erin aka Tink*~*~*. 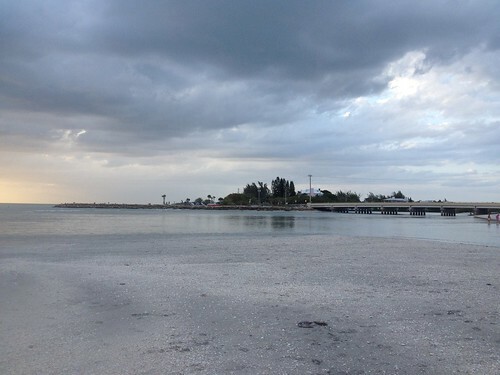 Algiers @ Sanibel, originally uploaded by Erin aka Tink*~*~*. 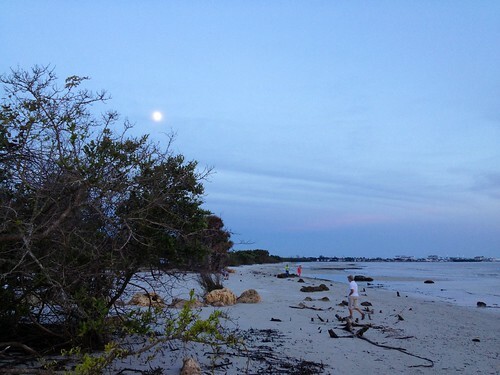 Sunset and full moon on Sanibel Island (video), originally uploaded by Erin aka Tink*~*~*. 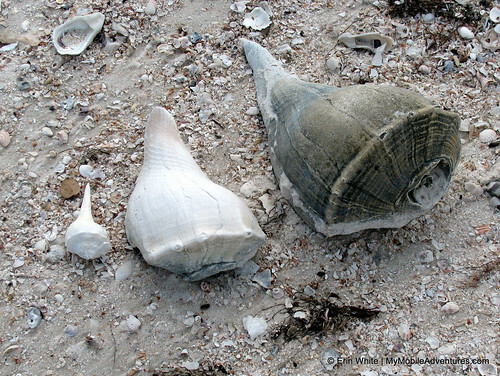 Gone shelling, originally uploaded by Erin aka Tink*~*~*. Not having a good day, originally uploaded by Erin aka Tink*~*~*. Drowned!, originally uploaded by Erin aka Tink*~*~*. It seems I am always rescuing lost toys. I should start a blog about this! Beachly Beauty, originally uploaded by Erin aka Tink*~*~*. I have made it all the way to the second spoil island – perhaps I will make landfall soon LOL but righ now, I am just diggin’ the scenery here. The Bridge And The Bay, originally uploaded by Erin aka Tink*~*~*. 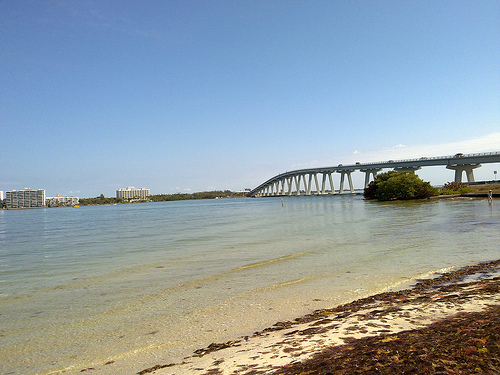 Sanibel Island Causeway from the first spoil island. The Full Flower Moon rises over Gulfside City Park, aka “Algiers” beach on Sanibel Island. Thursday May 27th, 2010. 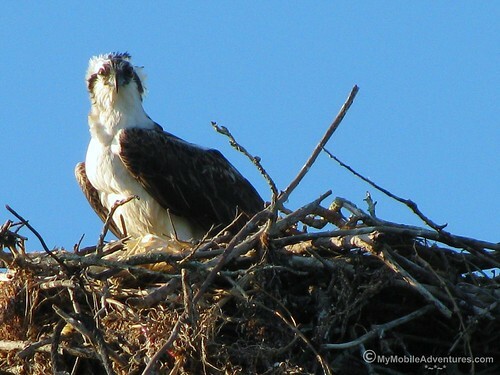 Almost-grown osprey awaits the return of a parent with dinner. Lighthouse Beach, Sanibel Island, Lee County, Southwest Florida. May 2010. 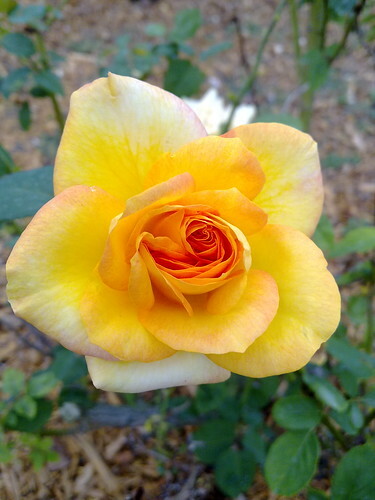 Yellow rose in bloom, aken at EPCOT on October 25th, 2010 – WITH A CAMERA PHONE! A great blue heron spears himself a meal from the pond in my back yard. October 10th 2010. 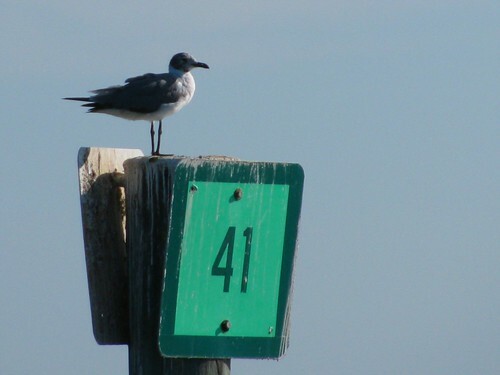 “There’s a guy off-camera throwing gawd knows what at these beach birds. 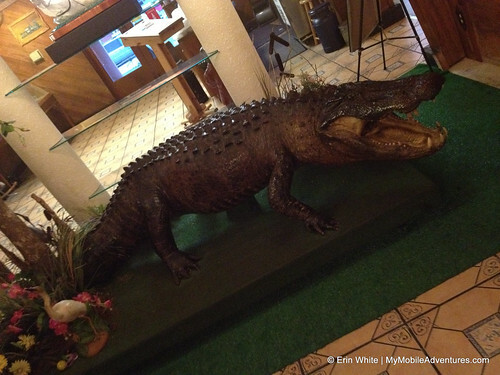 People, you should NOT feed wild animals! It makes them unafraid of people and they can become a nuisance or worse. Plus it makes them dependent on people for sustenance. 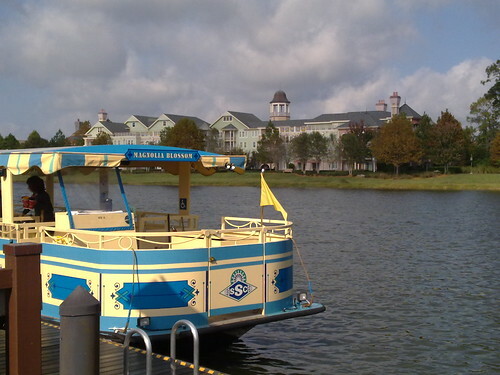 Taken at Downtown Disney in Orlando, Florida on December 5th 2010. Love the drama of the darkening sky behind the cheerful blue and yellow boat docked in the sunshine. Big Golden Ball – December 1st, 2010. 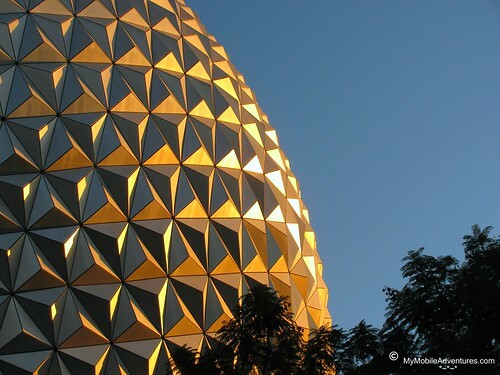 Really, it’s Spaceship Earth, the iconic geosphere at the entrance of Disney’s EPCOT theme park. Late-day sunlight glinting off the Big Silver Ball! (to quote an entry on Foursquare). Makes it look like The Big Golden Ball instead. 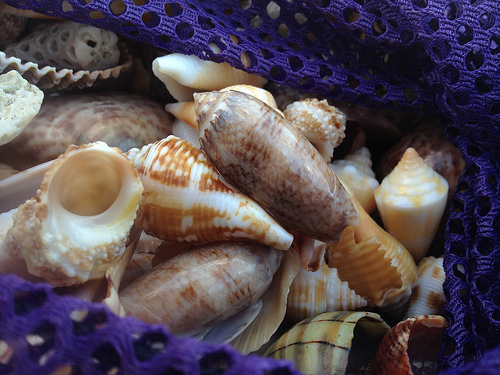 Treasure From San Carlos Bay, originally uploaded by Erin aka Tink*~*~*. 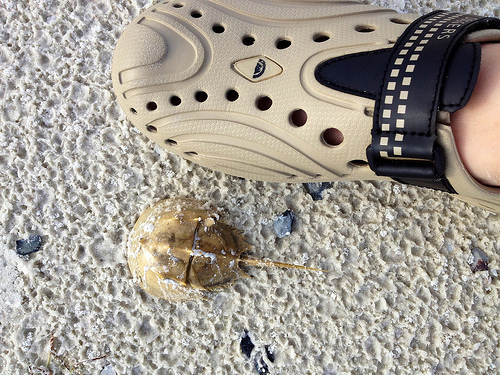 I found a nice, shiny, pointy-headed olive glistening on the beach at "Coney Island" (see Foursquare – I’m the Mayor!") 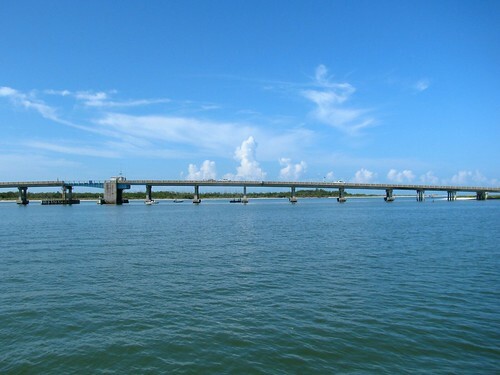 – it’s one of the spoil islands that supports the Sanibel Island Causeway. What a treat! 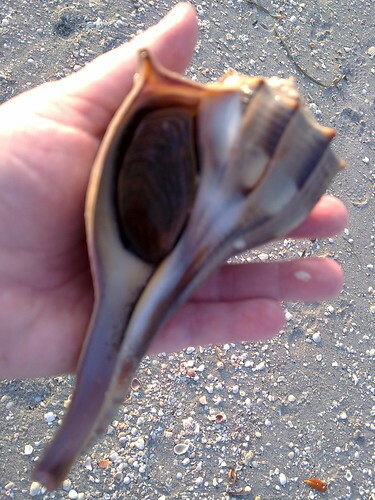 I figure a bird had it for an appetizer and left the shell for me to find. Thanks, random bird! 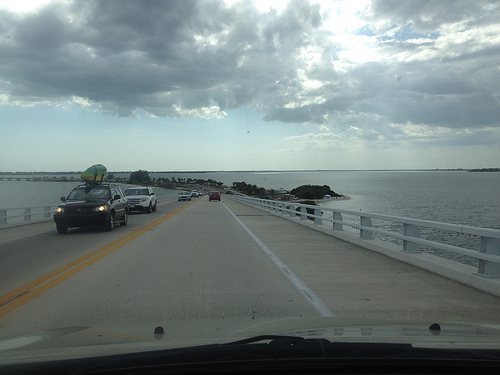 Beautiful afternoon on the Sanibel Island Causeway, originally uploaded by Erin aka Tink*~*~*. 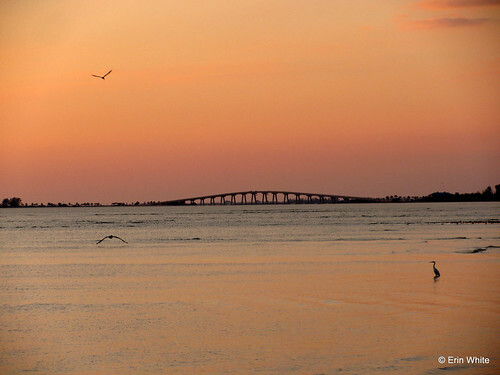 Kite Surfers on Sanibel Island Causeway, originally uploaded by Erin aka Tink*~*~*. 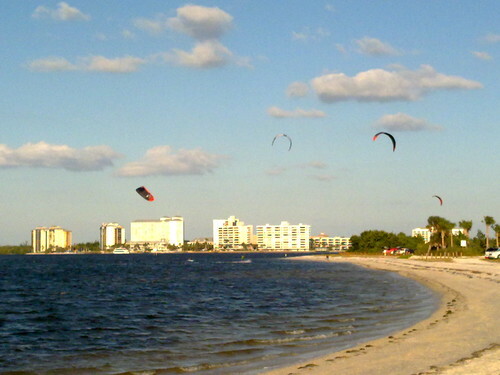 It’s beautiful, windy weather on Sanibel – perfect for kite surfing! 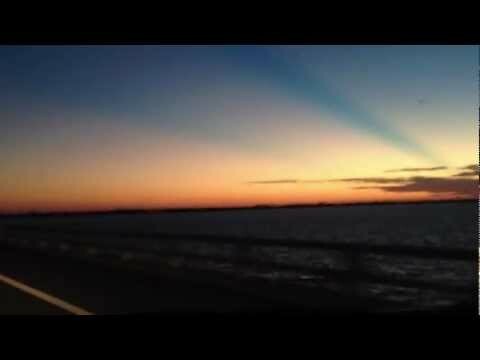 Frenzy on the Sanibel Island Causeway, originally uploaded by Erin aka Tink*~*~*. 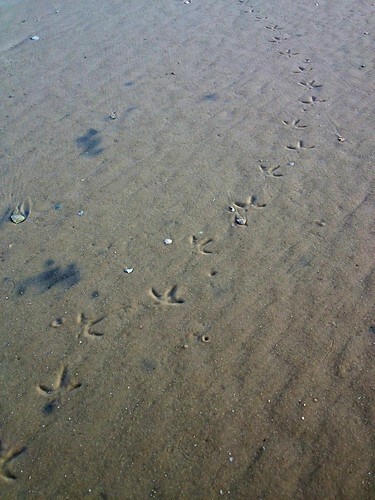 There’s a guy off-camera throwing gawd knows what at these beach birds. 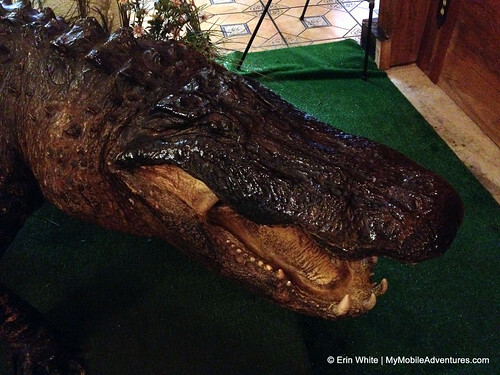 People, you should NOT feed wild animals! It makes them unafraid of people and they can become a nuisance or worse. Plus it makes them dependent on people for sustenance. 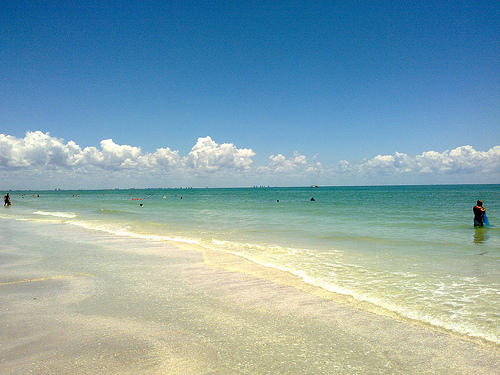 Last Friday, just before the three-day weekend festivities here in the United States, I took myself over to Sanibel Island for the day. I am very lucky to live within easy driving distance of the island (half an hour from driveway to causeway), and I really should do this more often. I was a little early for my appointment so I popped into a few shops. 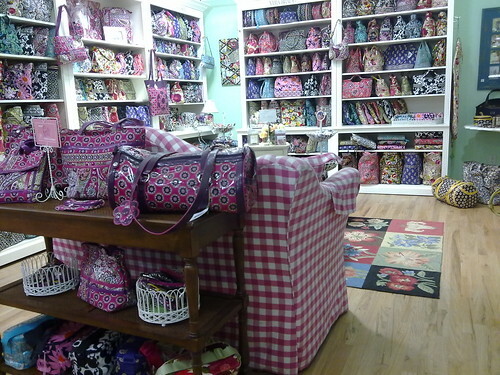 This one has a corner where it looks like Vera Bradley threw up! After the massage, I poked around in a few more shops and found this wall hanging at “Pandora’s Box”. I liked the sentiment and the presentation, but didn’t think it was worth what they were asking for it. 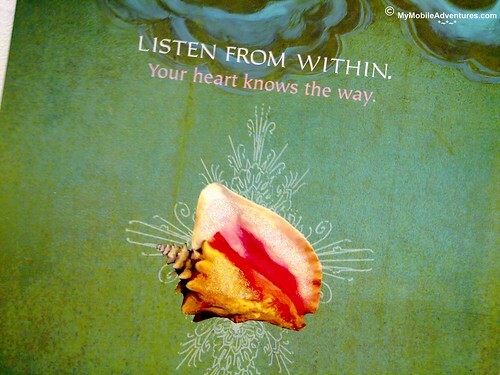 The artist’s name is Anahata Joy Katkin, in case you are interested in looking her up. 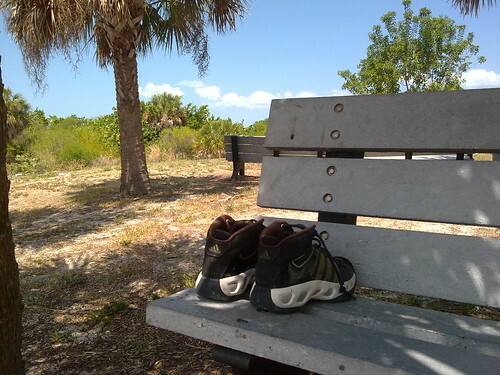 My last stop was Gulfside City Park aka Algiers, one of Sanibel Island’s public beaches. 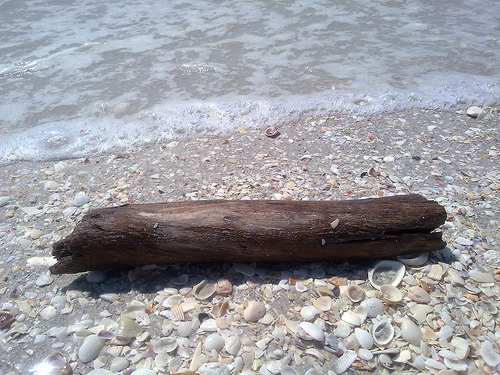 I stayed about two hours, hunting the shoreline for treasures. 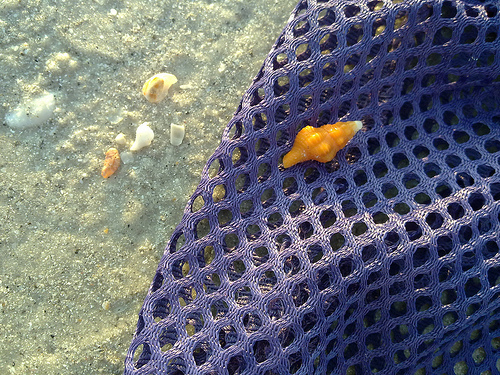 It was mostly “kibbles and bits” shelling, but I did manage to score a couple of macaroni and cheese shells (aka, those little orange juvenile Florida horse conch shells). 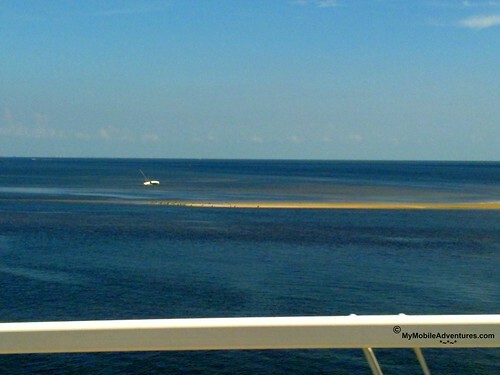 It was low tide by time I crossed the causeway again, and the sailboat that had run aground a few weeks back was now visible on that crescent-shaped sand bar just off the south side/”sad lane” (you’re sad cause you’re leaving Sanibel!). I wonder when someone is going to finally remove it – or is it destined to become a relic with all sorts of local legends attached to it? A few weeks ago, I went shelling at Blind Pass around sunset. 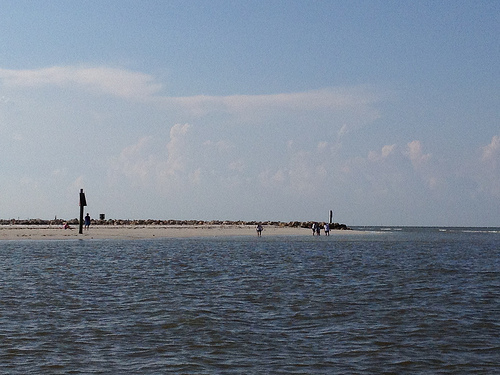 The tide was pretty low, and people were able to wade knee-high into the Pass. 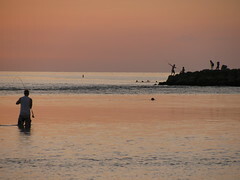 I stood on the Sanibel side and was interested in some kids who were playing on the jetty over on the Captiva side – fishing, horsing around, one of them striking a fencing pose with his fishing pole. “Hey, over here!” I hollered from the shore. “I’ve got a camera!” Whereupon the Fishing Dude held his snook aloft like a trophy and I took the shot. After they’d clambered out of the water, I asked for Fishing Dude’s email address so I could get the photos to him somehow. I ended up putting them into a set on my Flickr account and sending him the link. Here’s that set of photos in slide show format, untouched – I didn’t even put a watermark on them, in case Fishing Dude wanted to download any of them. Hope you all enjoy! 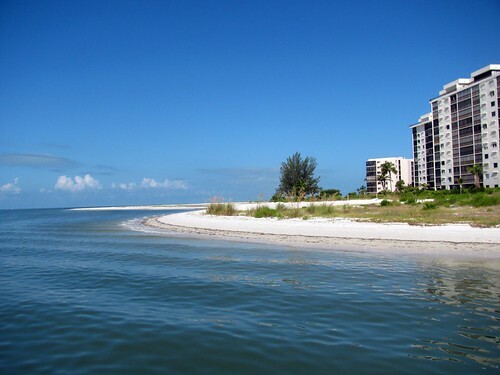 🙂 Last Friday, I drove out past Sanibel Island and crossed Blind Pass over to Captiva Island. At the end of Captiva, there’s a resort called South Seas, which has conference facilities. 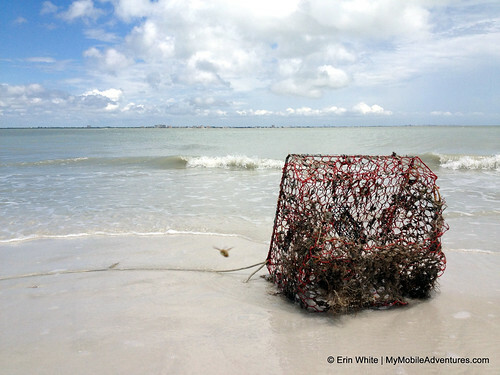 I was there to get some safety training for beach cleanup volunteers – want to be prepared in case the Gulf oil spill makes its way to the Lee Island Coast of Florida. The drive looks short-ish on the map, but is made longer by the 35 mile per hour speed limit (maximum) that’s enforced on both islands. 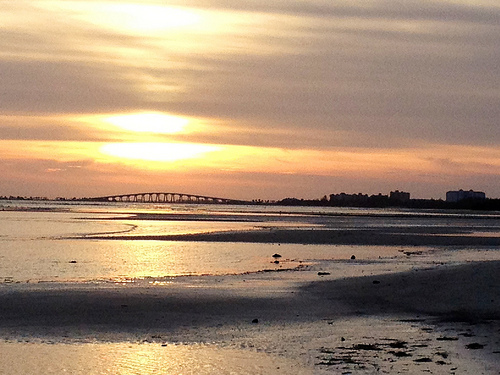 Pretty scenery is the saving grace – I wasn’t suffering at all! 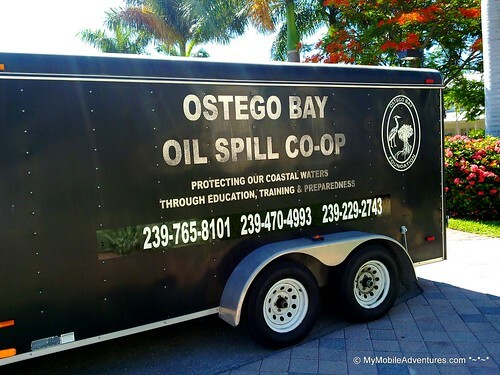 The course was four hours long and it was taught by a trainer from the Ostego Bay Oil Spill Co-Op and a trainer from OSHA – Occupational Safety & Health Administration. 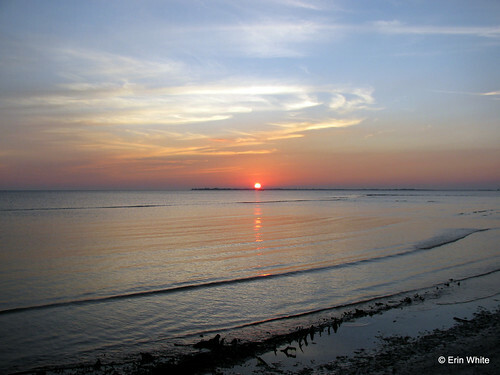 There were several different segments that explained the sensitivity of the Gulf coast, especially in the estuaries, the types of hazards that can be encountered in the environment that’s being cleaned, protective gear worn by cleanup workers, and the procedures they follow to maximize safety and minimize damage to people, wildlife, the environment and property. 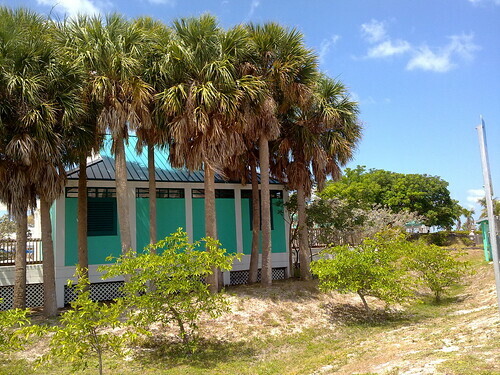 As conference facilities go – and I’ve been in a lot of them – South Seas has a lot going for it. 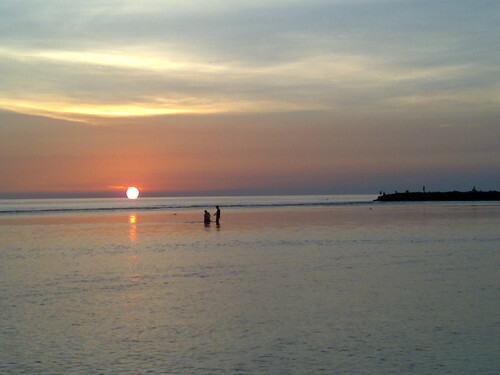 First, location – a sub-tropical island really cannot be beat. 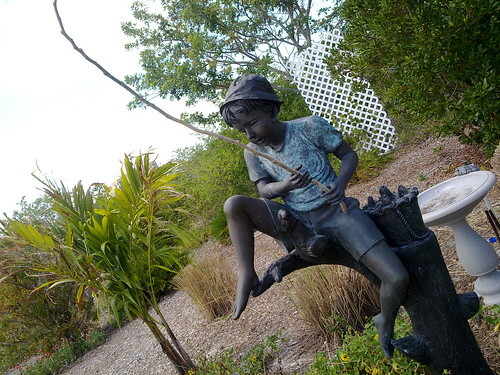 The grounds are nicely landscaped with tropical flowering shrubs and swaying palms. The conference facilities are not all worn out and tired-looking. They are clearly well-maintained. The air conditioning in the conference center was neither too strong nor too weak – just right for people wearing shorts and tank tops. 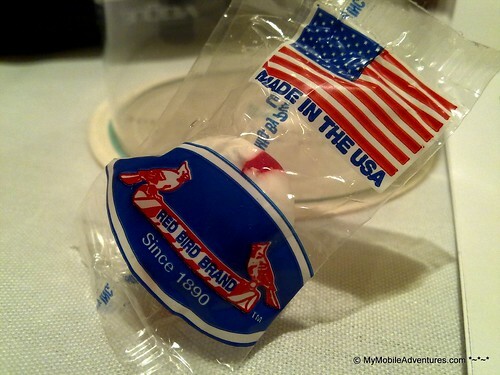 And the final thing to recommend South Seas – REAL iced tea was served, and there were candy jars on every table filled with “Made In The USA” mints. On this page, there are a few photos – there are several different styles of lighthouse in Florida, but amazingly there are several that look extremely similar to the one on Sanibel! 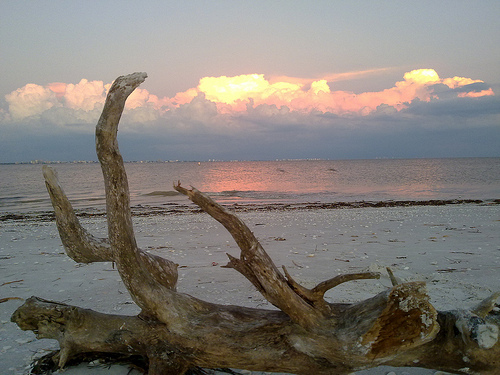 In fact, the one on Anclote Key is a dead ringer for the one on Sanibel. 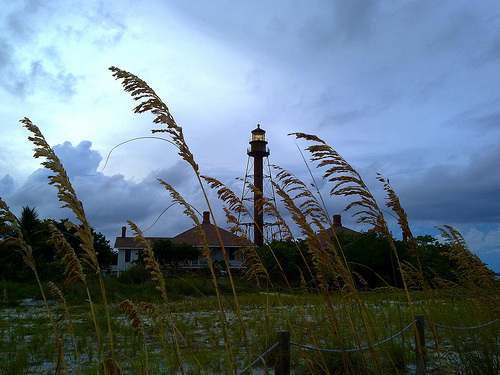 And finally – to see a fine collection of photos of lighthouses from all over the world, you should visit The Lighthouse Cafe on Sanibel Island. 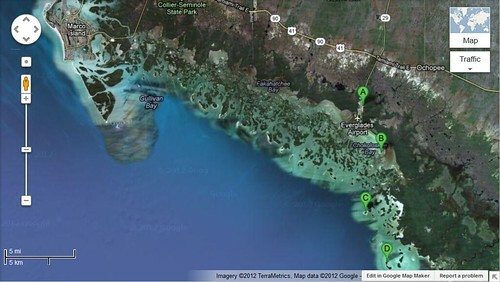 It’s on Periwinkle Way on the east end of the island. The walls inside the cafe are COVERED with photos of lighthouses, typically provided by tourists who stop there for a bite to eat. That last one gives me the urge to take a road trip! Fiishing at sunset, originally uploaded by Tink*~*~*. 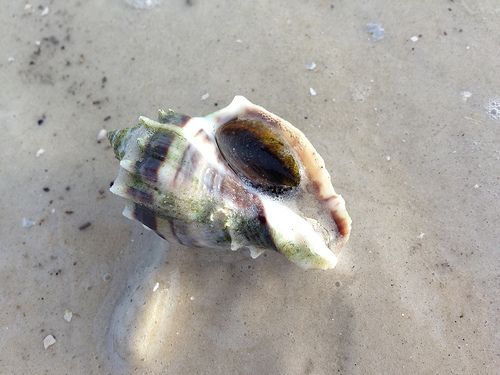 Live lightning whelk from Sanibel side of Blind Pass, originally uploaded by Tink*~*~*. Found king’s cown on Sannibel side of Blind Pass, originally uploaded by Tink*~*~*. Piles at the Pass, originally uploaded by Tink*~*~*. 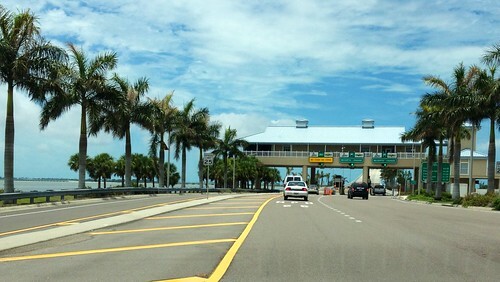 i am at Blind Pass. 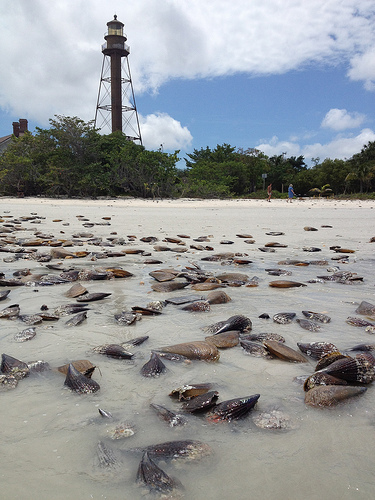 Big shell pile is all bivalves. lots of jellyfish in the water. 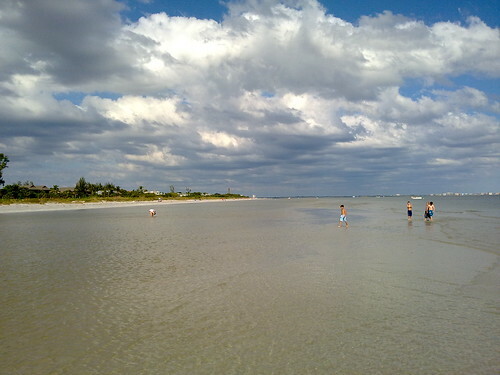 sea calm, people wading in mouth of Pass knees visible. Last Thursday (05-27-2010) was the “full flower moon” according to the Old Farmer’s Almanac. 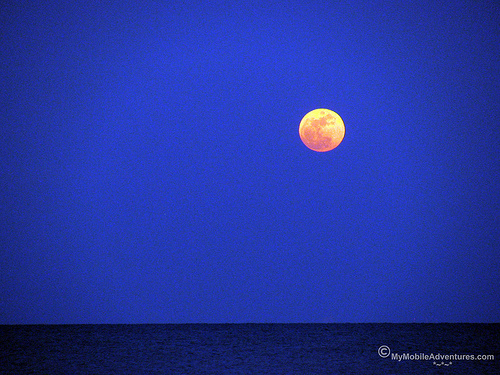 The moon was orange and huge as it hovered over the Gulf of Mexico. 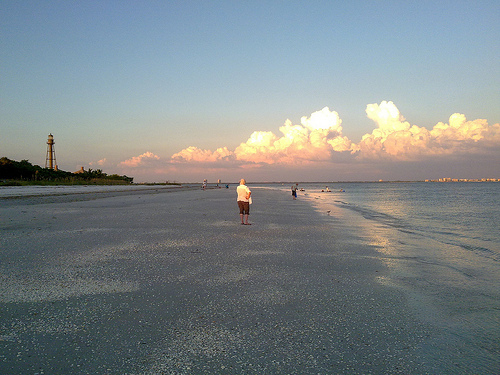 This is how it looked as seen from the beach at Gulfside City Park on Sanibel Island – more commonly known to locals as “Algiers”. Yay my favorite shell, originally uploaded by Tink*~*~*. This is what paradise means, originally uploaded by Tink*~*~*. 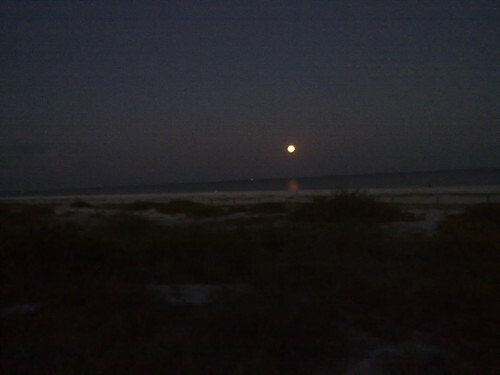 The moon hangs huge and orange over the Gulf. I can hear racoons callinng to one another in the gathering dusk. I damned near stepped on a SCORPION on my way back to tjhe car. OK not so much paradise but into every Eden a little evil must fall, to show you how good you’ve got it. I found a reeeeeDONKulous (Nieceling word) number of mac and cheese shells after transplanting myself to Algiers.